Clarence Mawson Marpole was born in Barrie, Ontario on March 4, 1878. His parents were Richard Marpole (1850-1920) and Emmeline Roach (1854-1933). 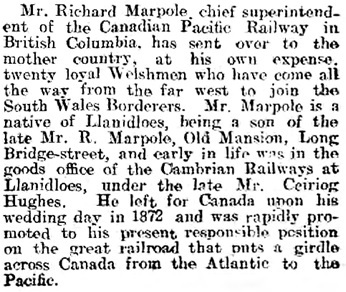 Richard Marpole was an executive with the Canadian Pacific Railway. “Richard Marpole,” British Columbia from the Earliest Times to the Present, volume 3, edited by E. O. S. Scholefield and Frederic William Howay; Vancouver, S.J. Clarke Publishing Company, 1914, page 745; https://archive.org/stream/britishcolumbiaf00schouoft#page/745/mode/1up. Richard Marpole was the general superintendent with the Canadian Pacific Railway’s Pacific Division in Vancouver. He was born on October 8, 1850 in Montgomeryshire, Wales (probably in Llanidloes). His parents were Richard Marpole and Eleanor Evans. The Cambrian News and Merionethshire Standard, July 4, 1879, page 5, column 6; http://newspapers.library.wales/view/3309404/3309409/30/. It appears that Richard Marpole, Senior went to live in Illinois, and that he died in Farmer City, Illinois on August 25, 1885. One source refers to Richard Marpole, Junior as “Richard Mawson Marpole,” but few, if any, original documents or other references include “Mawson” as his middle name. In 1863, Richard’s sister, Elizabeth, married Charles Loftus Mawson, who died in 1872, so that is one possible source for the Mawson name in the Marpole family. York Herald (York, England), November 21, 1863, page 7, column 6. Ancestry.com. England & Wales, National Probate Calendar (Index of Wills and Administrations), 1858-1966, 1973-1995 [database on-line]. Provo, UT, USA: Ancestry.com Operations, Inc., 2010. Name: Charles Loftus Mawson; Death Date: 14 Jan 1872; Death Place: Montgomery, Powys, Wales; Probate Date: 7 Feb 1872; Registry: Shrewsbury. Richard went to school in Wales and then in Glasgow, Scotland. He worked with railways in Britain for several years, including a period in the goods office of the Cambrian Railway Company at Llanidloes, Wales. 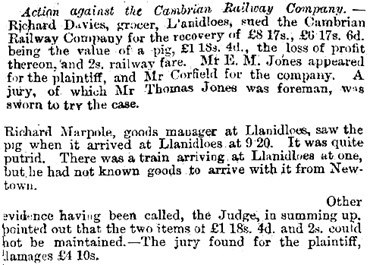 In 1871, he was a defence witness in a claim against the Cambrian Railway Company. The Cambrian News and Merionethshire Standard, June 9, 1871, page 9, column 3 [selected portions]. In late June or early July in 1872, in Llanidloes, Richard married Emmeline Roach. She was born in Cornwall, England on April 19, 1854. It appears that her parents were James Roach and Esther Johns Penberthy. James Roach was a mine agent at Bryntail, about two kilometres northwest of Llanidloes. Shortly after the wedding, Richard and Emmeline went to Canada. Richard’s early time in Canada included work on railway operations and construction, including a period with the Northern Railway. In 1878, he was the manager of a steamship operation at Barrie, Ontario. 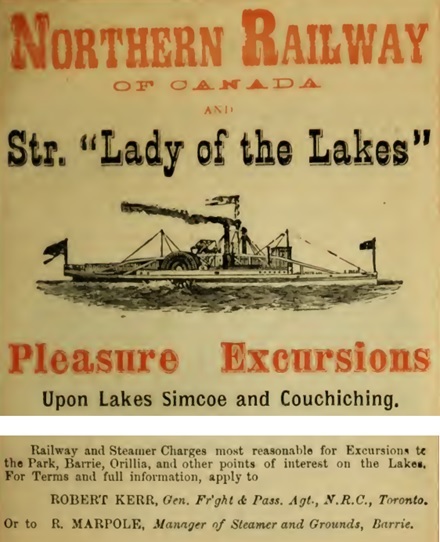 Excursion Season, 1878, Northern Railway of Canada and Great Rail and Lake Connections; printed by Bell and Company, Toronto, Ontario, page 29, [selected portions of page]; https://qspace.library.queensu.ca/bitstream/handle/1974/10031/excursionseason100nort.pdf. By 1881, he was a railway station master in Barrie. In 1882, he was a witness before the Royal Commission to Inquire into Matters Connected with the Canadian Pacific Railway. Royal Commission to Inquire into Matters Connected with the Canadian Pacific Railway [evidence], volume 2, 1882, page 1063 [beginning of testimony]; https://books.google.ca/books?id=R3IpAAAAYAAJ&pg=PA1063#v=onepage&q&f=false. He continued to work with the Canadian Pacific Railway during the 1880s. In 1882, he was the assistant manager of construction on the Algoma branch of the C.P.R.’s Nipissing division. He arrived in Kamloops about 1886, where he was a superintendent in the C.P.R.’s Pacific division. British Columbia Directory, 1887, page 253 (Kamloops). In 1889, he was based in Donald, British Columbia. Henderson’s BC Gazetteer and Directory, 1889, page 266 (Donald). C.P.R. officials at Stoney Creek, May 1894, Vancouver City Archives, CVA 256-01.19; https://searcharchives.vancouver.ca/c-p-r-officials-at-stoney-creek: (L-R): Harry Abbott, Mr. Erskine, P.A. Peterson, Sir William Van Horne, Mr. Jeffrey, Richard Marpole, Mrs. Hooper, Mr. Gavett, Sir C.S. Gzowski, [unidentified], and Mr. Nordheimer. Compare Glenbow Archives Image No: NA-1459-54: the unidentified man is called Mr. Macdonald; http://ww2.glenbow.org/search/archivesPhotosSearch.aspx. By 1897, he was the general superintendent of the Pacific Division, based in Vancouver. Henderson’s BC Gazetteer and Directory, 1897, page 649 (Vancouver). In 1899, he lived at 801 West Hastings Street, at the northwest corner of Hastings Street and Howe Street. Richard Marpole’s home, northwest corner of Howe and Hastings Street, Vancouver, 1903; British Columbia Archives, Item A-07455; https://search-bcarchives.royalbcmuseum.bc.ca/richard-marpoles-home-northwest-corner-of-howe-and-hastings-street-vancouver. In March 13, 1905, Richard obtained a divorce decree from Emmeline. They had separated on May 12, 1899. The divorce became absolute on September 14, 1905. 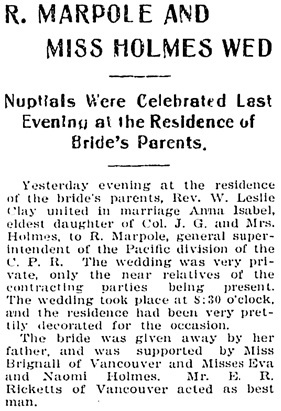 On September 16, 1905, Richard married Anna Isabel Holmes. She was born in Kingston, Ontario on December 4, 1879. Her parents were Josiah Greenwood Holmes (1845-1928) and Elizabeth Kew (1850-1926). Victoria Daily Colonist, September 17, 1905, page 2, column 3 [first portion of article]; https://archive.org/stream/dailycolonist19050917uvic/19050917#page/n1/mode/1up. After the marriage, Richard continued his career with the C.P.R. In 1906, he was a member of the posse that pursued Bill Miner (1847-1913), who was a notorious stagecoach and train robber. In 1907, Richard became the railway’s general executive assistant for B.C. After the C.P.R. 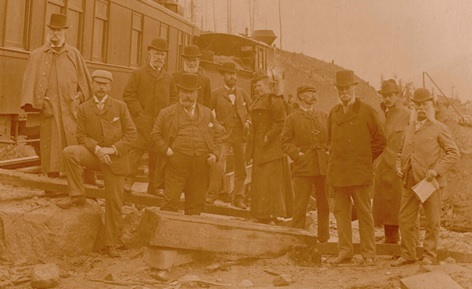 acquired the Esquimalt and Nanaimo Railway in 1905, Richard became the vice president of that railway. Along with his business interests, Richard was also involved in many social activities. He was the president of the Vancouver Cricket Club and the Anti-Tuberculosis Society. He belonged to the Vancouver Club and the Union Club in Victoria, British Columbia. Richard and Anna were in the Vancouver society directories in 1908 and 1914. Elite Directory of Vancouver, 1908, page 61. Vancouver Social Register and Club Directory, 1914, page 42. 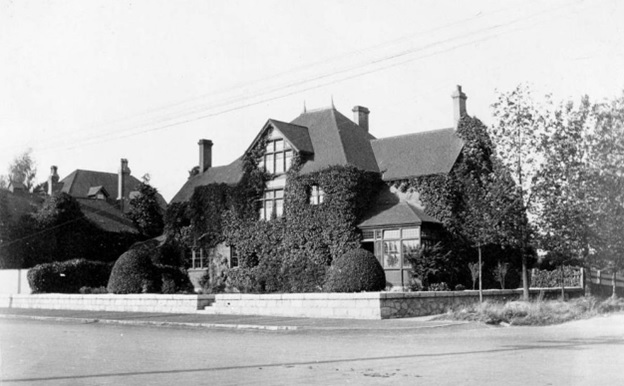 In 1909, Richard hired Honeyman and Curtis to design a new house at 1675 Angus Avenue in Shaughnessy Heights. Exterior of General John W. Stewart’s residence (“Roses”), 1675 Angus Drive, June 22, 1922; Vancouver City Archives, Bu P570; http://searcharchives.vancouver.ca/exterior-of-general-john-w-stewarts-residence-roses-1675-angus-drive. 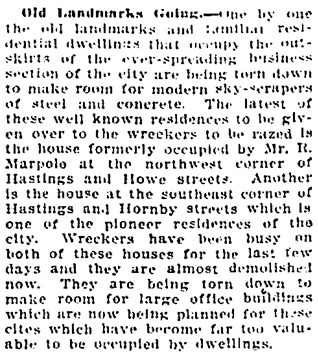 In 1912, property developers demolished the old house at Hastings Street and Howe Street. 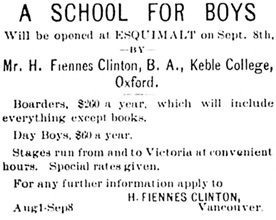 Vancouver Daily World, September 7, 1912, page 40, column 4. During the First World War, Richard paid the costs for twenty Welsh settlers in Canada to join the South Wales Borderers. Cambrian News and Merionethshire Standard, February 26, 1915, page 5, column 8; http://cymru1914.org/en/view/newspaper/3412692/4. In 1916, the South Vancouver neighbourhood of Eberne became Marpole, in honour of Richard. In the years after the war, Richard and Anna continued to travel. Vancouver Daily World, December 12, 1919, page 6, column 1. Richard died in Vancouver on June 8, 1920. He was buried in Mountain View Cemetery in Vancouver. Vancouver Daily World, June 8, 1920, page 1, column 7; page 11, column 5 [selected portions]. Richard’s estate had a net value of $558,000. Nanaimo Daily News, August 28, 1920, page 1, column 3. After Richard’s death, John William Stewart acquired the house at 1675 Angus Drive, and he lived there from 1920 to 1938. 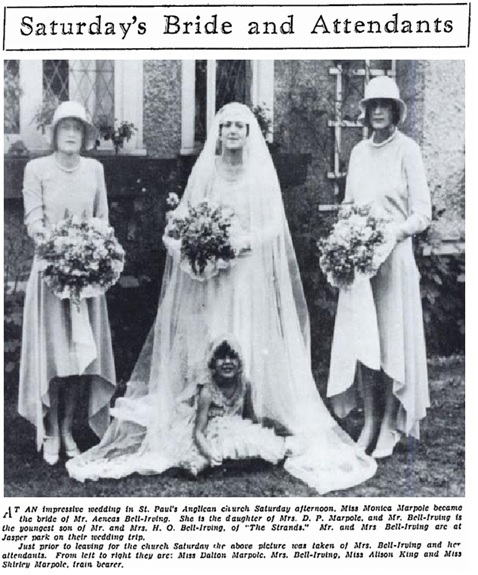 In 1924, in London, England, Anna married Major Cedric Rupert Hay. He was born in St. Kilda, Victoria, Australia on September 27, 1880. He had been an Australian rules football player and an army officer. Ancestry.com. London, England, Church of England Marriages and Banns, 1754-1932 [database on-line]. Provo, UT, USA: Ancestry.com Operations, Inc., 2010. London Metropolitan Archives; London, England; Reference Number: p84/cut/002. Name: Cadric Rupert Hay; Marriage Age: 43; Record Type: Marriage; Birth Date: abt 1881; Marriage Date: 3 Jan 1924; Marriage Place: St Cuthbert, Kensington, Kensington and Chelsea, England; Spouse: Anna Isabel Marple. In 1925, Cedric and Anna were living at Crofton, on Vancouver Island. Victoria Daily Colonist, April 24, 1925, page 8, column 2; https://archive.org/stream/dailycolonist0325uvic_46#page/n7/mode/1up. They later moved to Oak Bay, a suburb of Victoria, British Columbia. Anna died in Victoria on January 22, 1939. “British Columbia, Victoria Times Birth, Marriage and Death Notices, 1901-1939,” database with images, FamilySearch (https://familysearch.org/ark:/61903/1:1:QL38-92CL : 15 March 2018), Anna Isobel Hay, Death , British Columbia, Canada; from Victoria Daily Times news clippings, City of Victoria Archives, British Columbia, Canada; citing Victoria Daily Times, 23 Jan 1939; FHL microfilm 2,223,309 [page 13]. Cedric later lived in London, Ontario. He died on November 8, 1953. Ancestry.com. England & Wales, National Probate Calendar (Index of Wills and Administrations), 1858-1966, 1973-1995 [database on-line]. Provo, UT, USA: Ancestry.com Operations, Inc., 2010. Name: Cedric Rupert Hay; Death Date: 8 Nov 1953; Death Place: Canada; Probate Date: 27 Aug 1954; Registry: London, England. Emmeline did not re-marry after her divorce from Richard. She usually described herself as Richard’s widow. From about 1910 to 1931, she lived in Seattle, Washington. Seattle, Washington, City Directory, 1915, page 1089, column 2. Seattle, Washington, City Directory, 1931, page 1065, column 2. 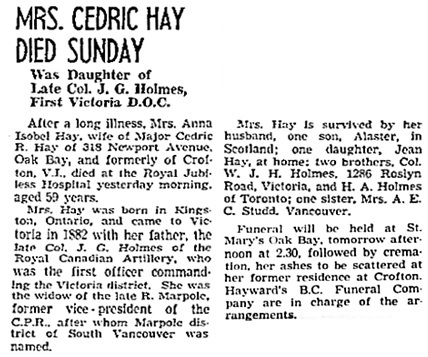 She died in Vancouver on November 26, 1933. She was buried in Mountain View Cemetery in Vancouver. Vancouver Sun, November 27, 1933, page 4, column 7; https://news.google.com/newspapers?id=Ky9lAAAAIBAJ&sjid=2ogNAAAAIBAJ&pg=4768%2C3158753. Richard and Emmeline Marpole had the following children. In 1881, he was living with his parents in Barrie, Ontario. In 1888, he was a student at a private school in Esquimalt, British Columbia. Rev. Henry Glynne Fiennes-Clinton (1854-1912) was the head of the school. In January 1920, Harry became ill with diphtheria. Richard went to Victoria on the Princess Louise. Victoria Daily Colonist, January 20, 1888, page 4, column 1; https://archive.org/stream/dailycolonist18880120uvic/18880120#page/n3/mode/1up. Harry died on January 20, 1888. Victoria Daily Colonist, January 24, 1888, page 1, column 7; https://archive.org/stream/dailycolonist18880124uvic/18880124#page/n0/mode/1up. 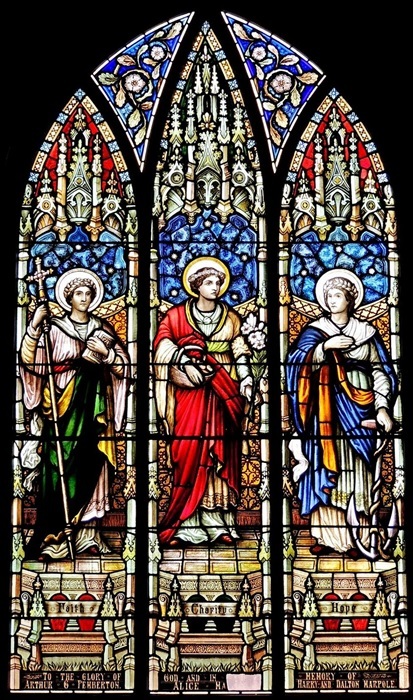 St. Paul’s Cathedral in Kamloops, British Columbia has a stained glass window dedicated, in part, to the memory of Harry and his brother, Dalton. Harry and Dalton Marpole Window – Kamloops, BC Image; http://staging.waymarking.com/gallery/image.aspx?f=1&guid=39d090f0-26ac-467a-89db-310fd9d46f9f. Clarence Mawson Marpole was born on March 4, 1878 in Barrie, Ontario. In the 1880s he went to public school in Kamloops, British Columbia. Vancouver Daily World, November 13, 1888, page 3, column 1. From 1894 to 1899, he worked at the Canadian Pacific Railway. Vancouver City Directory, 1896, page 152. In 1899, Clarence and his brother, Dalton, started a partnership with George E. MacDonald. 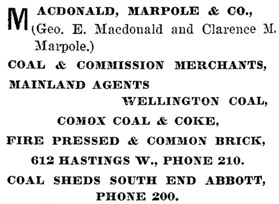 The firm was called MacDonald, Marpole and Company, and it operated a coal and commission merchant business. Henderson’s BC Gazetteer and Directory, 1901, page 732. 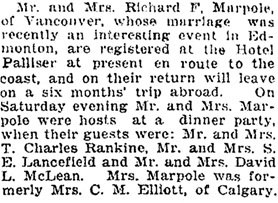 On December 12, 1901, in Vancouver, Clarence married Mary Gifford (“Dolly”) Edmonds. She was born on December 20, 1878 in New Westminster, British Columbia. Her parents were Henry Valentine Edmonds (1837-1897) and Jane Fortune Kemp (1840-1906). Vancouver Daily World, December 11, 1901, page 5, columns 4-5. Clarence and Dolly lived at the following addresses in Vancouver. In 1905, Dalton withdrew from the Macdonald, Marpole firm. Clarence and George created a new partnership, which had the same name as the former partnership. Vancouver Daily World, March 8, 1905, page 6, column 6. Clarence belonged to several clubs and associations. He was a member of the Vancouver Club, the Terminal City Club, and the Western Club. He also belonged to the Royal Vancouver Yacht Club and the Vancouver Rowing Club. He was a member of the A.F. & A.M. (Ancient Free and Accepted Masons). 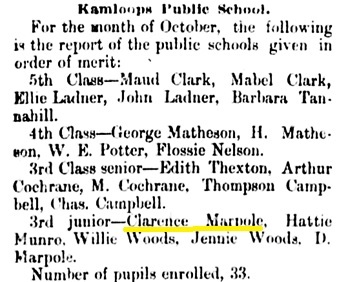 Clarence and Dolly appeared in the Vancouver society directory in 1908 and 1914. He bought the first Rolls-Royce automobile that was sold in Vancouver. The Vancouver directory listed Clarence and Dolly at separate addresses from 1914 to 1918. On September 25, 1916, Clarence signed his officer’s declaration paper to serve with the Canadian Expeditionary Force during the First World War. He was in Europe with the Railway Construction Corps when he became ill with an abdominal abscess. In June 1918, he returned to Canada to recuperate. Vancouver Daily World, June 10, 1918, page 14, columns 6-7 [first part of article]. He died in Vancouver on July 16, 1918. He was buried in Mountain View Cemetery in Vancouver. 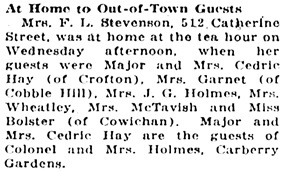 Vancouver Daily World, July 16, 1918, page 3, column 1. On September 4, 1918, in Vancouver, Dolly married William Page (“Billy”) Powell, who was a commission merchant. He was born in Newley, Yorkshire, England on April 7, 1875. His parents were William Powell and Clara Evelyn Page. Vancouver Daily World, September 5, 1918, page 6, column 2. Billy died in Vancouver on August 22, 1935. Dolly died in Essondale, British Columbia on November 24, 1963. Harry Gifford Marpole was born in Vancouver on May 3, 1903. He went to school at the University Military School in Victoria, Trinity College School in Port Hope, Ontario, and McGill University in Montreal, Quebec, where he received a Bachelor of Commerce degree. On June 27, 1935, in Montreal, he married Anna Monica Lyman. The Gazette (Montreal, Canada), June 27, 1935, page 8, column 1. Harry was an executive with R.C.A. Victor. The Ottawa Citizen, March 4, 1957, page 8, columns 7-8. He was a president of the Canadian Lawn Tennis Association. The Ottawa Citizen, August 13, 1957, page 19, columns 3-4. In 1972, Harry and Monica were living in Hudson, Quebec, which is west of Montreal. Ancestry.com. Canada, Voters Lists, 1935-1980 [database on-line]. Provo, UT, USA: Ancestry.com Operations, Inc., 2012. Name: Mr. Harry Marpole; Gender: Male; Occupation: Retired; Year: 1972; Location: Saint-Jean, Québec, Canada; Electoral District: Vaudreuil. Their marriage ended in divorce. Harry later married Kathleen Wilson, who was from Victoria, British Columbia. Her parents were Herbert Goulding Wilson (1872-1938) and Harriet Elizabeth Ross (1876-1969). Anna married Peter Charles Bell. Anna died in Vancouver on July 29, 1989. The Gazette (Montreal), August 21, 1989, page E-7, column 3. 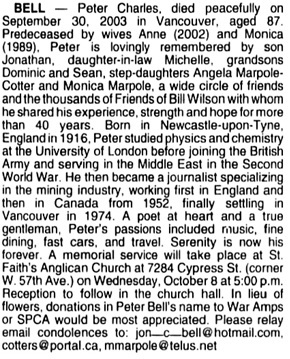 Peter died in Vancouver on September 20, 2003. Vancouver Sun, October 6, 2003, page F7, image 55, column 1. 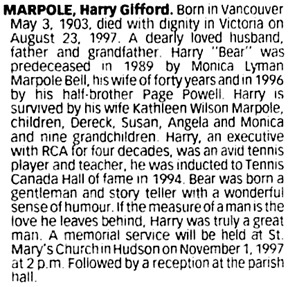 Harry Gifford Marpole died in Victoria, British Columbia on August 23, 1997. The Gazette (Montreal), October 25, 1997, page 94, column 4. 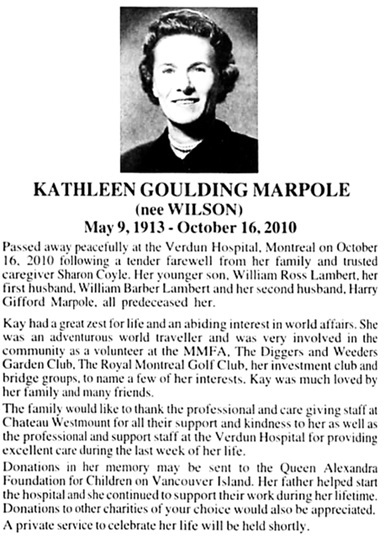 Kathleen Marpole died in Montreal on October 16, 2010. The Gazette (Montreal, Canada), October 23, 2010, page 44, columns 4-5 [selected portions]. Frances Richard Marpole was born about April 1905. Harry Page Powell was born in Vancouver on March 19, 1920. He married Joan Eileen Bryan. Harry worked in the automotive sales business. He died in Vancouver on July 18, 1996. Vancouver Sun, July 20, 1996, page F1, image 87, column 4. Vancouver Sun, December 27, 2004, page 58, column 9. In 1881 he was living with his parents in Barrie. In 1891, he was with his parents in Kamloops, British Columbia. He worked as a coal merchant with Macdonald, Marpole and Company, and he lived in the family home at 801 West Hastings Street. 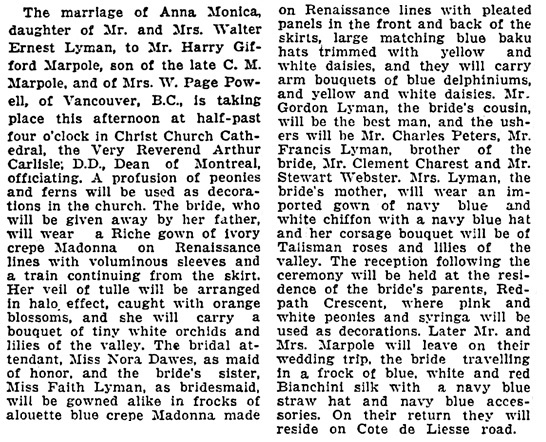 On January 11, 1904, in the Lakeview Hotel at Savona, British Columbia, Dalton married Katherine Annie Newland. She was born in New Westminster, British Columbia on December 8, 1879. Her parents were James Armstrong Newland (1832-1898) and Mary Pringle (1844-1924). 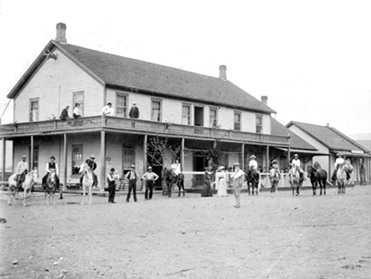 Savona Hotel, about 1898, British Columbia Archives, Item D-07723; https://search-bcarchives.royalbcmuseum.bc.ca/savona-hotel-3. Ashcroft Journal, January 16, 1904, reprinted in “Journal files help family locate roots,” Ashcroft Journal, August 16, 1983, pages 1-2. In 1904, Dalton and Katherine lived briefly at 774 Bidwell Street. In July 1904, they moved to 1050 Gilford Street. Vancouver Daily World, July 9, 1904, page 6, column 7. 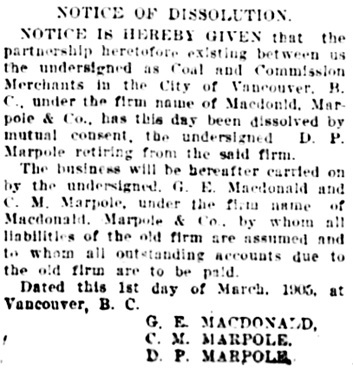 In 1905, Dalton withdrew from the Macdonald, Marpole firm. He and Katherine moved to the former Gordon Ranch, which was about 32 kilometres southeast of Spences Bridge on the Nicola branch of the Canadian Pacific Railway. The nearby railway stop was named “Dot” after Dalton’s nickname. Vancouver Daily World, January 4, 1908, page 15, column 2. Vancouver Daily World, January 29, 1908, page 1, column 2. He was buried in the Pioneer Cemetery in Kamloops. Katherine did not re-marry. She died in Vancouver on March 3, 1960. Vancouver Sun, March 4, 1960, page 31, column 4. Dalton and Katherine had the following children. Monica Primrose Marpole was born in Vancouver on April 19, 1905. 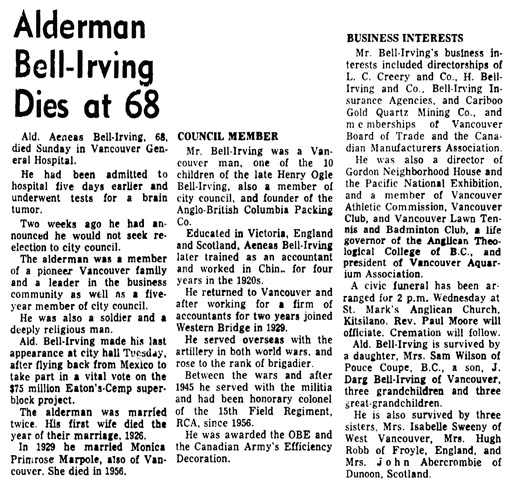 On July 20, 1929, in Vancouver, she married Aeneas McBean Bell-Irving. He was born in Vancouver on May 3, 1898. His parents were Henry Ogle Bell-Irving (1856-1931) and Maria Ysabel del Carmen Beattie (1863-1936). Vancouver Sun, July 20, 1929, page 6; https://news.google.com/newspapers?id=8m9mAAAAIBAJ&sjid=6IgNAAAAIBAJ&pg=1290%2C2511041 [link leads to column next to photograph]. Photo inserted from Vancouver Ltd., by Donald Gutstein; Vancouver, James Lorimer and Company, 1975, page 41; https://books.google.ca/books?id=tchhd4FUS98C&pg=PA41#v=onepage&q&f=false. Monica died in Vancouver on September 4, 1956. Vancouver Sun, September 6, 1956, page 30, column 3. Aeneas died in Vancouver on November 20, 1966. Mary Muriel Marpole was born in Vancouver on September 15, 1906. 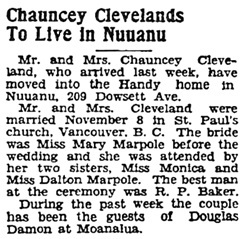 Mary and Chauncey lived in Honolulu, Hawaii. 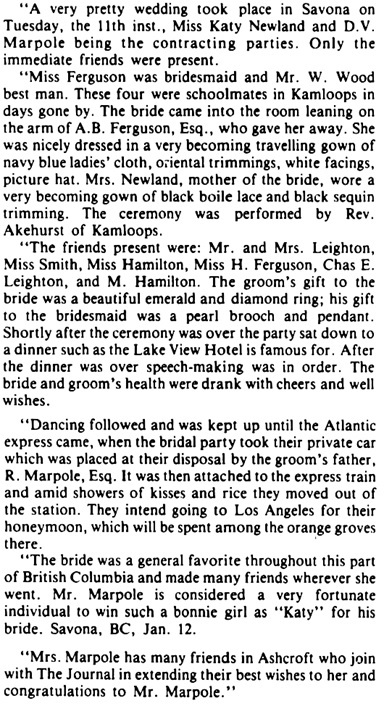 Honolulu Star-Bulletin, December 8, 1928, page 31, column 5. Mary died in Honolulu on September 8, 1972. Honolulu Star-Bulletin, September 11, 1972, page 48, column 3. Chauncey died in Hawaii in December 21, 1981. The Honolulu Advertiser, December 23, 1981, page 26, column 1. In 1923 she was attending Sacred Heart Convent in Point Grey (later part of Vancouver). 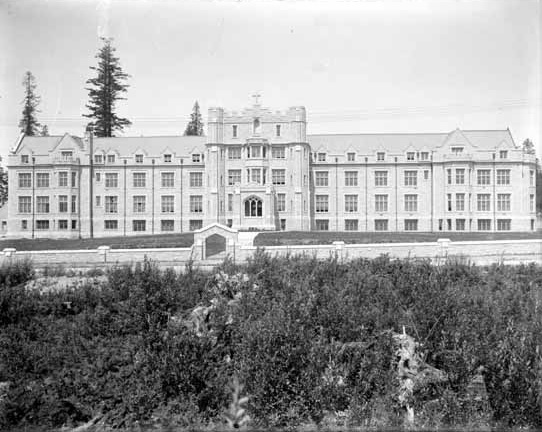 Convent of the Sacred Heart, 1914; Vancouver Public Library; VPL Accession Number: 4700; https://www3.vpl.ca/spePhotos/LeonardFrankCollection/02DisplayJPGs/311/4700.jpg. In April 1930 she was visiting her sister, Mary (Mrs. Chauncey Cleveland) in Honolulu, Hawaii. Dalton and Mary were part of a “cabaret interlude” at the Junior League’s holoku ball. 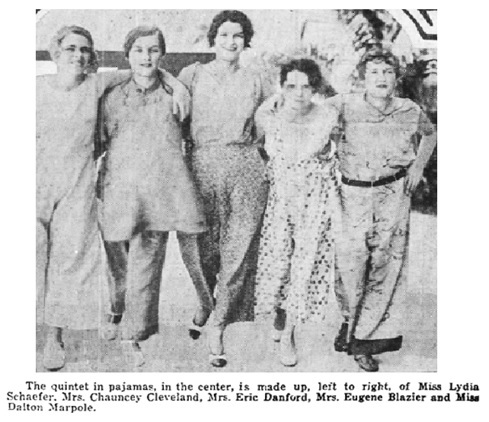 Honolulu Star-Bulletin, April 5, 1930, page 33, columns 2-4 and 5-7 [Mary Cleveland (née Marpole) is second from left; Dalton Marpole is on far right]. According to a 1944 immigration document, Dalton was with the Women’s Transport Service in the First Aid Nursing Yeomanry (Princess Royal’s Volunteer Corps) during the Second World War. “New York, New York Passenger and Crew Lists, 1909, 1925-1957,” database with images, FamilySearch (https://familysearch.org/ark:/61903/1:1:2HST-Q84 : 16 March 2018), Dalton P Marpole, 1944; citing Immigration, New York City, New York, United States, NARA microfilm publication T715 (Washington, D.C.: National Archives and Records Administration, n.d.). She worked as a travel agent. In the early 1960s, she lived in Englesea Lodge, which was at 2046 Beach Avenue. Ancestry.com. Canada, Voters Lists, 1935-1980 [database on-line]. Provo, UT, USA: Ancestry.com Operations, Inc., 2012. Name: Miss Dalton Marpole; Gender: Female; Occupation: Travel Agent; Year: 1963; Location: Vancouver, British Columbia, Canada; Electoral District: Vancouver Centre [2046 Beach Avenue]. She died in Vancouver on April 11, 1994. Vancouver Sun, April 13, 1994, page D13, image 45, column 6. Richard Frederick Marpole was born in Kamloops, British Columbia on September 26 or 27, 1887. In 1891, he was living with his parents in Kamloops. On May 3, 1912, in Pierce County, Washington, he married Zelma Ellen Greer. She was born in Yakima, Washington on August 2, 1889. Her parents were James Henry Greer (1865-1939) and Emily Pinder Cudlip (1867-1930). Vancouver Sun, July 12, 1939, page 18, column 5. “Washington, County Marriages, 1855-2008,” database with images, FamilySearch (https://familysearch.org/ark:/61903/1:1:QKNB-QBW2 : 28 September 2017), Richard Frederick Marpole and Zelma Ellen Greer, 03 May 1912, Pierce, Washington, United States, State Archives, Olympia; FamilySearch digital folder 004223823. The Tacoma Times (Tacoma, Washington), May 4, 1912, page 7, column 5. In 1921, Richard and Zelma were living at 1247 Beach Avenue. Richard was the president of Marpole Coal Company and Oscar Brown and Company. Richard and Zelma’s marriage ended in divorce. Vancouver Sun, October 22, 1927, page 11, column 3. Joy had been married before, to Chester M. Elliott. He died in Vancouver on October 19, 1924. Calgary Herald, October 20, 1924, page 14, columns 3-4. Calgary Herald, October 24, 1927, page 14, columns 3-4. Richard died in Vancouver on March 30, 1937. He was buried in Mountain View Cemetery in Vancouver. “British Columbia, Victoria Times Birth, Marriage and Death Notices, 1901-1939,” database with images, FamilySearch (https://familysearch.org/ark:/61903/1:1:QLBL-5T42 : 15 March 2018), Richard Frederick Marpole, Death , Vancouver, British Columbia, Canada; from Victoria Daily Times news clippings, City of Victoria Archives, British Columbia, Canada; citing Victoria Daily Times, 30 Mar 1937; FHL microfilm 2,223,307. Vancouver Sun, September 29, 1937, page 7, column 3. Olive died in Vancouver on June 3, 1967. She was buried in Mountain View Cemetery in Vancouver. Vancouver Sun, June 7, 1967, page 15, columns 1-2. 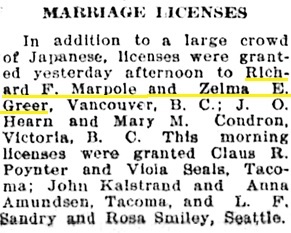 On September 28, 1928, in Vancouver, Zelma married John Duncan Dunsmuir, who was a salesman. He was born in Wellington, British Columbia on September 21, 1895. His parents were Martin Dunsmuir and Mary Duncan. Zelma died in Vancouver on July 19, 1964. Vancouver Sun, July 20, 1964, page 24, column 2. John died in Vancouver on October 13, 1976. Vancouver Sun, October 15, 1976, page 51, image 53, column 4. 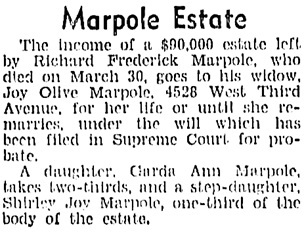 Richard Frederick Marpole had two daughters. In 1942, Shirley was working as a clerk in an aircraft-building business. On December 12, 1942, in Vancouver, she married Charles Hartley Atherden Thompson, who was a leading aircraftsman in the Royal Canadian Air Force. He was born in Bridlington, Yorkshire, England about 1920. His parents were Charles Joseph Thompson and Florence Elizabeth Hartley. This marriage ended in divorce on April 4, 1951 in Vancouver. In 1951, Shirley married Harry Barfield Chester Cotter. He was born in The Pas, Manitoba on June 28, 1921. His parents were Henry Martin Stuart Cotter and Beatrice Evans. Shirley and Chester moved to Quesnel, British Columbia in 1966. Chester worked as a salesman for C&C Wood Products. 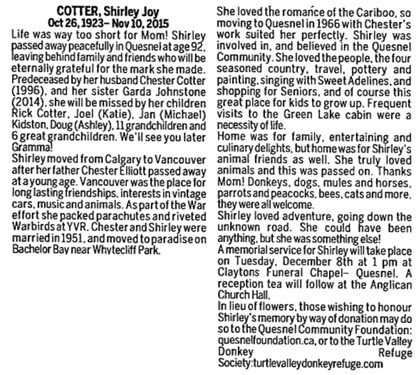 Shirley was involved in the arts community in Quesnel. 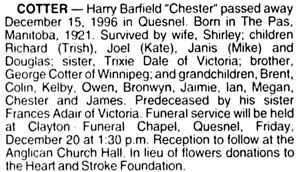 Chester died in Quesnel, British Columbia on December 16, 1996. Vancouver Sun, December 20, 1996, page 29, column 1. Shirley died in Quesnel on November 10, 2015. Vancouver Sun, November 21, 2015, page C17, image 52, column 1. Garda Ann Marpole was born in Vancouver in 1932. 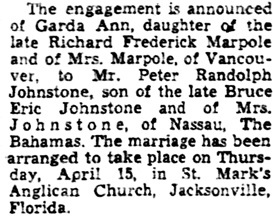 On April 15, 1954, in Jacksonville, Florida, she married Peter Randolph Johnstone. The Gazette (Montreal), April 9, 1954, page 21, column 7. In 1958, Peter and Garda were living at 4333 Suncrest Drive in Burnaby, British Columbia. Ancestry.com. Canada, Voters Lists, 1935-1980 [database on-line]. Provo, UT, USA: Ancestry.com Operations, Inc., 2012. Name: Peter R Johnstone; Occupation: Estate Officer; Year: 1958; Location: Burnaby; Richmond, British Columbia, Canada; Electoral District: Burnaby-Richmond. 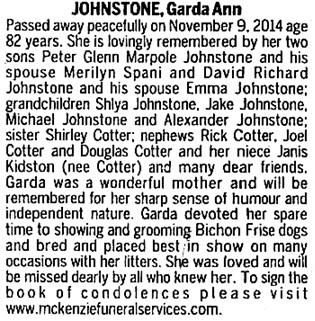 Garda died on November 9, 2014. Vancouver Sun, November 29, 2014, page E20, image 78, column 5. Richard Marpole (1818–1885); Birth: 1818, Llanidloes, Montgomeryshire, Wales; Death: 25 AUG 1885, Farmer City, De Witt, Illinois, United States (ancestry.ca). “Wales, Marriage Bonds, 1650-1900,” database, FamilySearch (https://familysearch.org/ark:/61903/1:1:QG2T-DWCN : 3 July 2018), Richard Marpole and Eleanor Evans, 24 Dec 1841; citing Marriage, Anglesey, Wales, United Kingdom, National Library of Wales, Aberystwyth. “England and Wales Census, 1851,” database with images, FamilySearch (https://familysearch.org/ark:/61903/1:1:SGD3-MT9 : 9 November 2017), Richard Marpole, Llanidloes, Montgomeryshire, Wales; citing Llanidloes, Montgomeryshire, Wales, p. 5, from “1851 England, Scotland and Wales census,” database and images, findmypast (http://www.findmypast.com : n.d.); citing PRO HO 107, The National Archives of the UK, Kew, Surrey. “England and Wales Census, 1861,” database with images, FamilySearch (https://familysearch.org/ark:/61903/1:1:M7FV-WFK : 12 December 2017), Richard Marpole, Llanidloes, Montgomeryshire, Wales; from “1861 England, Scotland and Wales census,” database and images, findmypast (http://www.findmypast.com : n.d.); citing PRO RG 9, The National Archives, Kew, Surrey. “England and Wales Census, 1871”, database with images, FamilySearch (https://familysearch.org/ark:/61903/1:1:V5BT-NRX : 10 December 2017), Richard Marpole, 1871. “England and Wales Census, 1881,” database with images, FamilySearch (https://familysearch.org/ark:/61903/1:1:Q2WS-MM7V : 12 December 2017), Richard Marpol in household of John Morgans, Aberystwith, Cardiganshire, Wales; from “1881 England, Scotland and Wales Census,” database and images, findmypast (http://www.findmypast.com : n.d.); citing p. 35, Piece/Folio 5445/70, The National Archives, Kew, Surrey; FHL microfilm 101,775,490. Eleanor Evans (1822–1879); Birth: ABOUT 1822, Llanidloes, Montgomeryshire, Wales; Death: 29 JUN 1879, Aberystwyth, Cardiganshire, Wales (ancestry.ca). “Wales, Marriage Bonds, 1650-1900,” database, FamilySearch (https://familysearch.org/ark:/61903/1:1:QG2T-DWCV : 3 July 2018), Richard Marpole and Eleanor Evans, 24 Dec 1841; citing Marriage, Anglesey, Wales, United Kingdom, National Library of Wales, Aberystwyth. “England and Wales Census, 1851,” database with images, FamilySearch (https://familysearch.org/ark:/61903/1:1:SGD3-MTS : 9 November 2017), Eleanor Marpole in household of Richard Marpole, Llanidloes, Montgomeryshire, Wales; citing Llanidloes, Montgomeryshire, Wales, p. 5, from “1851 England, Scotland and Wales census,” database and images, findmypast (http://www.findmypast.com : n.d.); citing PRO HO 107, The National Archives of the UK, Kew, Surrey. “England and Wales Census, 1861,” database with images, FamilySearch (https://familysearch.org/ark:/61903/1:1:M7FV-WF2 : 12 December 2017), Eleanor Marpole in household of Richard Marpole, Llanidloes, Montgomeryshire, Wales; from “1861 England, Scotland and Wales census,” database and images, findmypast (http://www.findmypast.com : n.d.); citing PRO RG 9, The National Archives, Kew, Surrey. “England and Wales Census, 1871”, database with images, FamilySearch (https://familysearch.org/ark:/61903/1:1:V5BT-NRF : 10 December 2017), Ellenor Marpole in entry for Richard Marpole, 1871. “Wales, Montgomeryshire, Parish Registers, 1538-1912,” database, FamilySearch (https://familysearch.org/ark:/61903/1:1:KC1N-Z4K : 11 February 2018), Eleanor Marpole, 03 Jul 1879, Burial; from “Parish Records Collection 1538-2005,” database and images, findmypast (http://www.findmypast.com : 2012); citing Llanidloes, Montgomeryshire, Wales, The National Archives, Kew, Surrey; FHL microfilm . Elizabeth Marpole (1843–1902); Birth: 19 NOV 1843, Llanidloes, Wales; Death: 18 JUL 1902, Shrewsbury, England, United Kingdom (ancestry.ca). “England and Wales Census, 1851,” database with images, FamilySearch (https://familysearch.org/ark:/61903/1:1:SGD3-MTQ : 9 November 2017), Elizabeth Marpole in household of Richard Marpole, Llanidloes, Montgomeryshire, Wales; citing Llanidloes, Montgomeryshire, Wales, p. 5, from “1851 England, Scotland and Wales census,” database and images, findmypast (http://www.findmypast.com : n.d.); citing PRO HO 107, The National Archives of the UK, Kew, Surrey. “England and Wales Census, 1861,” database with images, FamilySearch (https://familysearch.org/ark:/61903/1:1:M7FV-WFL : 12 December 2017), Elizabeth Marpole in household of Richard Marpole, Llanidloes, Montgomeryshire, Wales; from “1861 England, Scotland and Wales census,” database and images, findmypast (http://www.findmypast.com : n.d.); citing PRO RG 9, The National Archives, Kew, Surrey. “Wales, Montgomeryshire, Parish Registers, 1538-1912,” database, FamilySearch (https://familysearch.org/ark:/61903/1:1:KC1N-38B : 11 February 2018), Charles Loftus Mawson and Elizabeth Marpole, 05 Nov 1863, Marriage; from “Parish Records Collection 1538-2005,” database and images, findmypast (http://www.findmypast.com : 2012); citing Llanidloes, Montgomeryshire, Wales, The National Archives, Kew, Surrey. “England and Wales Marriage Registration Index, 1837-2005,” database, FamilySearch (https://familysearch.org/ark:/61903/1:1:2DPY-YVF : 13 December 2014), Elizabeth Mawson, 1877; from “England & Wales Marriages, 1837-2005,” database, findmypast (http://www.findmypast.com : 2012); citing 1877, quarter 1, vol. 11B, p. 62, Aberystwyth, Cardiganshire, Wales, General Register Office, Southport, England. [possible connection]. “England Births and Christenings, 1538-1975,” database, FamilySearch (https://familysearch.org/ark:/61903/1:1:NR7Z-MVH : 11 February 2018, Charles Loftus Mawson, 11 May 1834); citing , index based upon data collected by the Genealogical Society of Utah, Salt Lake City; FHL microfilm 990,865. “Wales, Montgomeryshire, Parish Registers, 1538-1912,” database, FamilySearch (https://familysearch.org/ark:/61903/1:1:KC1N-38Y : 11 February 2018), Charles Loftus Mawson and Elizabeth Marpole, 05 Nov 1863, Marriage; from “Parish Records Collection 1538-2005,” database and images, findmypast (http://www.findmypast.com : 2012); citing Llanidloes, Montgomeryshire, Wales, The National Archives, Kew, Surrey. “England and Wales Death Registration Index 1837-2007,” database, FamilySearch (https://familysearch.org/ark:/61903/1:1:2JLT-7CM : 31 December 2014), Charles Loftus Mawson, 1872; from “England & Wales Deaths, 1837-2006,” database, findmypast (http://www.findmypast.com : 2012); citing Death, Newtown, Montgomeryshire, Wales, General Register Office, Southport, England. “Wales, Montgomeryshire, Parish Registers, 1538-1912,” database, FamilySearch (https://familysearch.org/ark:/61903/1:1:KC1N-ZMK : 11 February 2018), Charles Loftus Mawson, 19 Jan 1872, Burial; from “Parish Records Collection 1538-2005,” database and images, findmypast (http://www.findmypast.com : 2012); citing Llanidloes, Montgomeryshire, Wales, The National Archives, Kew, Surrey; FHL microfilm . “England and Wales, National Index of Wills and Administrations, 1858-1957,” database, FamilySearch (https://familysearch.org/ark:/61903/1:1:QPJ3-V4LD : 30 August 2018), Charles Loftus Mawson, 7 Feb 1872; citing Probate, Shrewsbury, Shropshire, England, United Kingdom, Her Majesty’s Stationery Office, Great Britain. ; FHL microfilm . “Richard Marpole,” A History; British Columbia, by R. Edward Gosnell; compiled by Lewis Publishing Company; Hill Binding Company, 1906, pages 704-705; https://archive.org/stream/historybritishco00gosnrich#page/704/mode/1up; https://archive.org/stream/historybritishco00gosnrich#page/705/mode/1up. The Canadian Men and Women of the Time, second edition, by Henry James Morgan; Toronto, Ontario, William Briggs, 1912, page 731; https://archive.org/stream/canadianmenwomen02morguoft#page/731/mode/1up. “Richard Marpole,” British Columbia from the Earliest Times to the Present, volume 3, edited by E. O. S. Scholefield, and Frederic William Howay; Vancouver, S.J. Clarke Publishing Company, 1914, pages 744-747 [includes photograph portrait]; https://archive.org/stream/britishcolumbiaf00schouoft#page/744/mode/1up; https://archive.org/stream/britishcolumbiaf00schouoft#page/747/mode/1up; portrait: https://archive.org/stream/britishcolumbiaf00schouoft#page/745/mode/1up. “Richard Marpole,” Northern Who’s Who; A Biographical Dictionary of Men and Women, volume 1, by Dr. C.W. Parker; Vancouver, Western Press Association and International Press Limited, 1916, page 502; https://archive.org/stream/northernwhoswhob01park#page/502/mode/1up. “Richard Marpole,” British Columbia’s Business Leaders of the Century, edited by David Mitchell with Shari Graydon, Supplement to Business in Vancouver, issue 529A, 1999, pages 22-23 [includes photographs]. “England and Wales Birth Registration Index, 1837-2008,” database, FamilySearch (https://familysearch.org/ark:/61903/1:1:26TP-C4V : 1 October 2014), Richard Marpole, 1850; from “England & Wales Births, 1837-2006,” database, findmypast (http://www.findmypast.com : 2012); citing Birth Registration, Newtown, Montgomeryshire, Wales, citing General Register Office, Southport, England. “Wales, Montgomeryshire, Parish Registers, 1538-1912,” database, FamilySearch (https://familysearch.org/ark:/61903/1:1:KC1N-WZQ : 11 February 2018), Richard Marpole, 27 Oct 1850, Baptism; from “Parish Records Collection 1538-2005,” database and images, findmypast (http://www.findmypast.com : 2012); citing Llanidloes, Montgomeryshire, Wales, The National Archives, Kew, Surrey; FHL microfilm . “England and Wales Census, 1851,” database with images, FamilySearch (https://familysearch.org/ark:/61903/1:1:SGD3-MT4 : 9 November 2017), Richard Marpole in household of Richard Marpole, Llanidloes, Montgomeryshire, Wales; citing Llanidloes, Montgomeryshire, Wales, p. 5, from “1851 England, Scotland and Wales census,” database and images, findmypast (http://www.findmypast.com : n.d.); citing PRO HO 107, The National Archives of the UK, Kew, Surrey. “England and Wales Census, 1861,” database with images, FamilySearch (https://familysearch.org/ark:/61903/1:1:M7FV-WF5 : 12 December 2017), Richard Marpole in household of Richard Marpole, Llanidloes, Montgomeryshire, Wales; from “1861 England, Scotland and Wales census,” database and images, findmypast (http://www.findmypast.com : n.d.); citing PRO RG 9, The National Archives, Kew, Surrey. “England and Wales Census, 1871”, database with images, FamilySearch (https://familysearch.org/ark:/61903/1:1:V5BT-NRN : 10 December 2017), Richard Marpole in entry for Richard Marpole, 1871. “England and Wales Marriage Registration Index, 1837-2005,” database, FamilySearch (https://familysearch.org/ark:/61903/1:1:2DLN-5R4 : 6 January 2015), Richard Marpole, 1872; from “England & Wales Marriages, 1837-2005,” database, findmypast (http://www.findmypast.com : 2012); citing 1872, quarter 2, vol. 11B, p. 289, Newtown, Montgomeryshire, Wales, General Register Office, Southport, England. Royal Commission to Inquire into Matters Connected with the Canadian Pacific Railway [evidence], volume 2, 1882, pages 1048, 1063-67, and 1071; https://books.google.ca/books?id=R3IpAAAAYAAJ&pg=PA1048#v=onepage&q&f=false; https://books.google.ca/books?id=R3IpAAAAYAAJ&pg=PA1063#v=onepage&q&f=false; https://books.google.ca/books?id=R3IpAAAAYAAJ&pg=PA1071#v=onepage&q&f=false. “Canada Census, 1881,” database with images, FamilySearch (https://familysearch.org/ark:/61903/1:1:MVFC-RZ2 : 11 March 2018), Richard Marpole, ; from “1881 Canadian Census.” Database with images. Ancestry. (www.ancestry.com : 2008); citing Barrie, Simcoe North, Ontario, Canada; 1850; p. 78; Library and Archives Canada film number C-13251, Library and Archives Canada, Ottawa, Ontario. “Canada Census, 1891,” database, FamilySearch (https://familysearch.org/ark:/61903/1:1:MWKQ-PK2 : 3 August 2016), Richard Morpole, Kamloops, Yale, British Columbia, Canada; Public Archives, Ottawa, Ontario; Library and Archives Canada film number 30953_148094. “Canada Census, 1901,” database with images, FamilySearch (https://familysearch.org/ark:/61903/1:1:KHVJ-MBZ : 18 March 2018), Richard Marpole, Burrard, British Columbia, Canada; citing p. 1, Library and Archives of Canada, Ottawa. Vol. 2 Pages 037, 38, 39, 46 Petitioner: husband; Marpole Richard and Roach Emmeline; Dissolved: 13 Mar 1905 Absolute: 14 Sep 1905; Co-respondent(s): Arthur Griffin & James Dixon Townley; Remarks: They had separated 12 May 1899. Child: Richard Frederick Marpole. ; 1881CEN: Barrie, ON, d.1, p.78: MARPOLE: Richard, 31, WLS, station master; Emmeline, 27, ENG; John H., 6, ON; Clarence M., 3, ON & Dalton, 1, ON. All CE. ; BRI: Richard F. Marpole, 27 Sep 1887, Kamloops. ; DR: Richard Frederick Marpole, b.Kamloops, 26 Sep 1887, d.Vancouver, 30 Mar 1937, r.801 West Georgia St, Vancouver, retired merchant, h.o. Joy Marpole, s.o. Richard Marpole, b.WLS & Emmeline Roach, b.ENG. ; 1901CEN: Victoria, Emmeline Marpole, d.10, p.8, l.42. ; MR: Richard Marpole, 53, r.Vancouver, b.MGY, WLS, divorced, railway official, C.P.R., CE, s.o. Richard & Eleanor mar Anna Isabel Holmes, 26, r.Victoria, b.Kingston, ON, spin., CE, d.o. Josiah Greenwood Holmes & Elizabeth Holmes, 16 Sep 1905, Victoria. ; DRI: Richard Marpole, 8 Jun 1920, 69, Vancouver. ; DR: Emmeline Marpole, b.ENG, 19 Apr 1854, d.Vancouver, 26 Nov 1933, r.2812 Yukon St, Vancouver, wid, d.o. John Roach, b.ENG & —- Evans, b.ENG. “British Columbia Marriage Registrations, 1859-1932; 1937-1938,” database with images, FamilySearch (https://familysearch.org/ark:/61903/1:1:JD8C-JLH : 11 March 2018), Richard Marpole and Anna Isabel Holmes, 16 Sep 1905; citing Victoria, British Columbia, Canada, British Columbia Archives film number B11368, Vital Statistics Agency, Victoria; FHL microfilm 1,983,525. 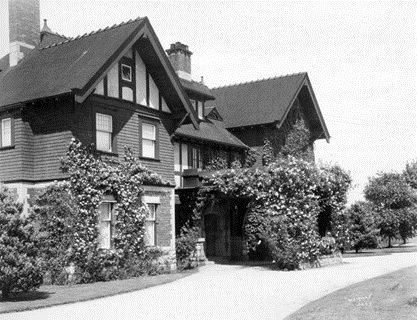 Biographical Dictionary of Architects in Canada, 1800 to 1950; Honeyman, John James Bastion; http://dictionaryofarchitectsincanada.org/node/1522: “Angus Drive, near Granville Street, residence for Richard Marpole, 1909-10 (City of Vancouver Planning Dept., Vancouver Building Register, 1973). Bill Miner, Wikipedia article; https://en.wikipedia.org/wiki/Bill_Miner. This Week in History: 1906 – The legendary outlaw Bill Miner robs a train near Kamloops, by John Mackie, Vancouver Sun, updated May 6, 2016; (includes photographs); https://vancouversun.com/news/local-news/this-week-in-history-1906-the-legendary-outlaw-bill-miner-robs-a-train-near-kamloops. Posse bringing in Bill Miner gang [photograph], May 1906, Vancouver Public Library, VPL Accession Number 756, https://www3.vpl.ca/spePhotos/LeonardFrankCollection/02DisplayJPGs/183/756.jpg. Posse bringing in Bill Miner gang [photograph], May 1906, Vancouver Public Library, VPL Accession Number 755, https://www3.vpl.ca/spePhotos/LeonardFrankCollection/02DisplayJPGs/183/755.jpg. “Recensement du Canada de 1911,” database, FamilySearch (https://familysearch.org/ark:/61903/1:1:QV95-SF9F : 16 March 2018), Richard Marpole, 1911; citing Census, Vancouver Sub-Districts 51-76, British Columbia, Canada, Library and Archives of Canada, Ottawa, Ontario; FHL microfilm 2,417,663. “British Columbia Death Registrations, 1872-1986; 1992-1993”, database, FamilySearch (https://familysearch.org/ark:/61903/1:1:FLKF-TLL : 8 November 2017), Richard Marpole, 1920. “Richard Marpole, Pioneer Railway Official, Is Dead; General Executive Assistant of Canadian Pacific Succumbs to Heart Failure in Seventieth Year; Saw Vancouver Grow Out of Bush to Be Great City,” Vancouver Province, June 9, 1920, pages 7, 12 (includes photograph of Richard Marpole). First page of probate file; image 2428 of 3122; https://www.familysearch.org/ark:/61903/3:1:3QSQ-G97Z-FTN4?i=2427&wc=M69J-D68%3A332530701%2C332530502%2C333323201&cc=2014768; last page of probate file; image 2702 of 3122; https://www.familysearch.org/ark:/61903/3:1:3QSQ-G97Z-FRBK?i=2701&wc=M69J-D68%3A332530701%2C332530502%2C333323201&cc=2014768. “R. 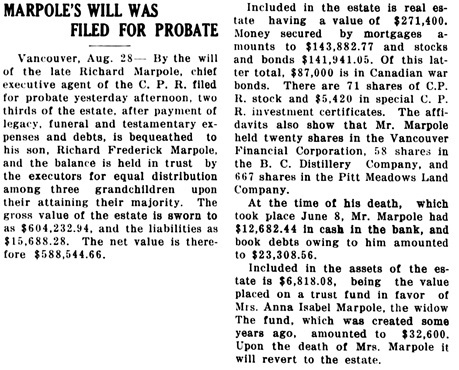 Marpole Estate is Filed at $588,544 Net; Youngest Son Gets Two-Thirds Under Father’s Will,” Vancouver Daily World, August 27, 1920, page 10, columns 3-4. “England and Wales Birth Registration Index, 1837-2008,” database, FamilySearch (https://familysearch.org/ark:/61903/1:1:2NWK-6NX : 1 October 2014), Emmeline Roach, 1853; from “England & Wales Births, 1837-2006,” database, findmypast (http://www.findmypast.com : 2012); citing Birth Registration, Helston, Cornwall, England, citing General Register Office, Southport, England. “England and Wales Census, 1871”, database with images, FamilySearch (https://familysearch.org/ark:/61903/1:1:V515-5NJ : 10 December 2017), Emmiline Roach in entry for James Roach, 1871. “England and Wales Marriage Registration Index, 1837-2005,” database, FamilySearch (https://familysearch.org/ark:/61903/1:1:2DLJ-XW3 : 13 December 2014), Emmeline Roach, 1872; from “England & Wales Marriages, 1837-2005,” database, findmypast (http://www.findmypast.com : 2012); citing 1872, quarter 2, vol. 11B, p. 289, Newtown, Montgomeryshire, Wales, General Register Office, Southport, England. “Canada Census, 1881,” database with images, FamilySearch (https://familysearch.org/ark:/61903/1:1:MVFC-RZL : 11 March 2018), Emmeline Marpole in entry for Richard Marpole, ; from “1881 Canadian Census.” Database with images. Ancestry. (www.ancestry.com : 2008); citing Barrie, Simcoe North, Ontario, Canada; 1854; p. 78; Library and Archives Canada film number C-13251, Library and Archives Canada, Ottawa, Ontario. “Canada Census, 1891,” database, FamilySearch (https://familysearch.org/ark:/61903/1:1:MWKQ-PKL : 3 August 2016), Emmeline Morpole, Kamloops, Yale, British Columbia, Canada; Public Archives, Ottawa, Ontario; Library and Archives Canada film number 30953_148094. “Canada Census, 1901,” database with images, FamilySearch (https://familysearch.org/ark:/61903/1:1:KHVJ-MB8 : 18 March 2018), Emma Marpole, Burrard, British Columbia, Canada; citing p. 1, Library and Archives of Canada, Ottawa. “Canada Census, 1901,” database with images, FamilySearch (https://familysearch.org/ark:/61903/1:1:KHV2-3FF : 18 March 2018), Emmeline Marpole, Victoria, British Columbia, Canada; citing p. 8, Library and Archives of Canada, Ottawa. “United States Census, 1920,” database with images, FamilySearch (https://familysearch.org/ark:/61903/1:1:MHF5-1D4 : accessed 9 September 2018), Emmeline Marpole in household of Mary Sullivan, Seattle, King, Washington, United States; citing ED 172, sheet 3A, line 17, family 59, NARA microfilm publication T625 (Washington D.C.: National Archives and Records Administration, 1992), roll 1927; FHL microfilm 1,821,927. “United States Census, 1930,” database with images, FamilySearch (https://familysearch.org/ark:/61903/1:1:XC38-3RZ : accessed 9 September 2018), Emmeline Merpole, Seattle, King, Washington, United States; citing enumeration district (ED) ED 141, sheet 7B, line 54, family , NARA microfilm publication T626 (Washington D.C.: National Archives and Records Administration, 2002), roll 2499; FHL microfilm 2,342,233. “British Columbia Death Registrations, 1872-1986; 1992-1993”, database, FamilySearch (https://familysearch.org/ark:/61903/1:1:FL54-BB4 : 8 November 2017), Emmeline Marpole, 1933. “Mrs. Marpole Dies,” Vancouver Sun, November 27, 1933, page 4, column 7; https://news.google.com/newspapers?id=Ky9lAAAAIBAJ&sjid=2ogNAAAAIBAJ&pg=4768%2C3158753. 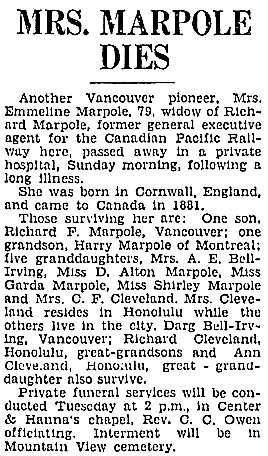 “Pioneer Passes; Mrs. E. Marpole, Widow of C.P.R. Officer, Dies,” Vancouver News-Herald, November 27, 1933, page 2. “Mrs. 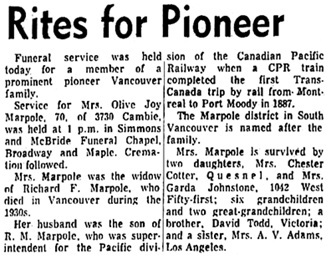 Richard Marpole is Laid at Rest,” Vancouver Province, November 28, 1933, page 2. 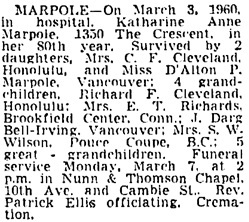 Emmeline Marpole, death notice, Vancouver Province, November 27, 1933, page 13; Vancouver Sun, November 27, 1933, page 12, column 1; https://news.google.com/newspapers?id=Ky9lAAAAIBAJ&sjid=2ogNAAAAIBAJ&pg=2142%2C3202907. 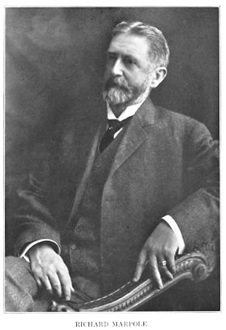 Josiah Greenwood Holmes, Canadian Men and Women of the Time, second edition, by Henry J. Morgan; Toronto, William Briggs, 1912, page 543; https://archive.org/stream/canadianmenwomen00morguoft#page/543/mode/1up. “Ontario Marriages, 1869-1927,” database with images, FamilySearch (https://familysearch.org/ark:/61903/1:1:FMFK-YQ7 : 11 March 2018), Josiah Greenwood Holmes and Lizzie Kew, 27 Jun 1870; citing registration , Beamsville, Lincoln, Ontario, Canada, Archives of Ontario, Toronto; FHL microfilm 1,862,474. “British Columbia Death Registrations, 1872-1986; 1992-1993”, database, FamilySearch (https://familysearch.org/ark:/61903/1:1:FL2Z-NLL : 8 November 2017), Josiah Greenwood Holmes, 1928. “Ontario Marriages, 1869-1927,” database with images, FamilySearch (https://familysearch.org/ark:/61903/1:1:FMFK-YQH : 11 March 2018), Josiah Greenwood Holmes and Lizzie Kew, 27 Jun 1870; citing registration , Beamsville, Lincoln, Ontario, Canada, Archives of Ontario, Toronto; FHL microfilm 1,862,474. “British Columbia Death Registrations, 1872-1986; 1992-1993”, database, FamilySearch (https://familysearch.org/ark:/61903/1:1:FL24-K5N : 8 November 2017), Elizabeth Holmes, 1926. “Ontario Births, 1869-1912,” database with images, FamilySearch (https://familysearch.org/ark:/61903/1:1:FM8L-TZR : 16 July 2017), Anna Isabella Holmes, 04 Dec 1879; citing Birth, Kingston, Frontenac, Ontario, Canada, citing Archives of Ontario, Toronto; FHL microfilm 1,845,220. “Canada Census, 1881,” database with images, FamilySearch (https://familysearch.org/ark:/61903/1:1:MVJD-1FL : 11 March 2018), Ada Ross in entry for Josiah Holmes, ; from “1881 Canadian Census.” Database with images. Ancestry. (www.ancestry.com : 2008); citing St-Louis Ward, Québec (City), Quebec, Canada; 1854; p. 44; Library and Archives Canada film number C-13211, Library and Archives Canada, Ottawa, Ontario. “British Columbia Marriage Registrations, 1859-1932; 1937-1938,” database with images, FamilySearch (https://familysearch.org/ark:/61903/1:1:JD8C-JL7 : 11 March 2018), Richard Marpole and Anna Isabel Holmes, 16 Sep 1905; citing Victoria, British Columbia, Canada, British Columbia Archives film number B11368, Vital Statistics Agency, Victoria; FHL microfilm 1,983,525. “Recensement du Canada de 1911,” database, FamilySearch (https://familysearch.org/ark:/61903/1:1:QV95-SF9N : 16 March 2018), Annie I Marpole in entry for Richard Marpole, 1911; citing Census, Vancouver Sub-Districts 51-76, British Columbia, Canada, Library and Archives of Canada, Ottawa, Ontario; FHL microfilm 2,417,663. “England and Wales Marriage Registration Index, 1837-2005,” database, FamilySearch (https://familysearch.org/ark:/61903/1:1:QVZP-HLCD : 8 October 2014), Anna I Marpole and null, 1924; from “England & Wales Marriages, 1837-2005,” database, findmypast (http://www.findmypast.com : 2012); citing 1924, quarter 1, vol. 1A, p. 173, Kensington, London, England, General Register Office, Southport, England. “British Columbia Death Registrations, 1872-1986; 1992-1993”, database, FamilySearch (https://familysearch.org/ark:/61903/1:1:FL22-BMP : 8 November 2017), Anna Isabel Hay, 1939. “British Columbia, Victoria Times Birth, Marriage and Death Notices, 1901-1939,” database with images, FamilySearch (https://familysearch.org/ark:/61903/1:1:QL38-92CL : 15 March 2018), Anna Isobel Hay, Death , British Columbia, Canada; from Victoria Daily Times news clippings, City of Victoria Archives, British Columbia, Canada; citing Victoria Daily Times, 23 Jan 1939; FHL microfilm 2,223,309. Ancestry.com. Australia, Birth Index, 1788-1922 [database on-line]. Provo, UT, USA: Ancestry.com Operations, Inc., 2010. Name: Cedric Rupert Hay; Birth Date: Abt 1880; Birth Place: St Kilda, Victoria; Registration Year: 1880; Registration Place: Victoria, Australia; Father: Alfred Hay; Mother: Annie Oofrayer Dufrayer; Registration Number: 25393. “England and Wales Marriage Registration Index, 1837-2005,” database, FamilySearch (https://familysearch.org/ark:/61903/1:1:QVZP-4H2W : 8 October 2014), Cedric R Hay and null, 1924; from “England & Wales Marriages, 1837-2005,” database, findmypast (http://www.findmypast.com : 2012); citing 1924, quarter 1, vol. 1A, p. 173, Kensington, London, England, General Register Office, Southport, England. Ancestry.com. 1939 England and Wales Register [database on-line]. Lehi, UT, USA: Ancestry.com Operations, Inc., 2018. The National Archives; Kew, London, England; 1939 Register; Reference: RG 101/579F. Name: Cedric R Hay; Gender: Male; Marital Status: Widowed; Birth Date: 27 Sep 1880; Residence Year: 1939; Residence Place: Wandsworth, London, England; Occupation: Major Middle? ?x Regi; Schedule Number: 2; Sub Schedule Number: 31; Enumeration District: AXDF; Registration district: 24/1 145. “Australia, Victoria, Index to Probate Registers, 1841-1989,” database with images, FamilySearch (https://familysearch.org/ark:/61903/1:1:JV6V-16J : 9 March 2018), Cedric R Hay, 06 Sep 1954; citing Melbourne, Victoria, Australia, series 479, record 981, Public Record Office, Victoria; FamilySearch digital folder 004105518. “British Columbia, Victoria Times Birth, Marriage and Death Notices, 1901-1939,” database with images, FamilySearch (https://familysearch.org/ark:/61903/1:1:Q2DS-WQHD : 15 March 2018), Alice Lesley Hay, Death , Victoria, Vancouver Island, British Columbia, Canada; from Victoria Daily Times news clippings, City of Victoria Archives, British Columbia, Canada; citing Victoria Daily Times, 18 Mar 1922; FHL microfilm 2,218,894. John Henry Roach Marpole; Birth: 06 Aug 1874 in King, York, Ontario, Canada; Death: 20 Jan 1888 in Victoria, British Columbia (ancestry.ca). “Ontario Births, 1869-1912,” database with images, FamilySearch (https://familysearch.org/ark:/61903/1:1:FM3L-PHW : 16 July 2017), John Henry Roach Marpole, 06 Aug 1874; citing Birth, King, York, Ontario, Canada, citing Archives of Ontario, Toronto; FHL microfilm 1,845,045. “Canada Census, 1881,” database with images, FamilySearch (https://familysearch.org/ark:/61903/1:1:MVFC-RZG : 11 March 2018), John H. Marpole in entry for Richard Marpole, ; from “1881 Canadian Census.” Database with images. Ancestry. (www.ancestry.com : 2008); citing Barrie, Simcoe North, Ontario, Canada; 1875; p. 78; Library and Archives Canada film number C-13251, Library and Archives Canada, Ottawa, Ontario. “British Columbia Death Registrations, 1872-1986; 1992-1993”, database, FamilySearch (https://familysearch.org/ark:/61903/1:1:FLGL-357 : 8 November 2017), Harry Marpole, 1888; http://search-collections.royalbcmuseum.bc.ca/Image/Genealogy/c2d4c87a-9969-4e12-b99c-50ba38b67f4a. Clarence Mawson Marpole: Birth: 04 Mar 1878 in Barrie, Ontario, Canada; Death: 16 Jul 1918 in Vancouver, British Columbia, Canada (ancestry.ca). Clarence Mawson Marpole in entry for Henry Valentine Edmonds, Vancouver Voters, 1886, pages 274-275. “Clarence Mawson Marpole,” Northern Who’s Who; A Biographical Dictionary of Men and Women, volume 1, by Dr. C.W. Parker; Vancouver, Western Press Association and International Press Limited, 1916, page 502; https://archive.org/stream/northernwhoswhob01park#page/502/mode/1up. “Canada Births and Baptisms, 1661-1959,” database, FamilySearch (https://familysearch.org/ark:/61903/1:1:F2J6-89Z : 10 February 2018), Clarence Maisson Marpole, 04 Mar 1878; citing Barrie, Simcoe, Ontario, 04 Mar 1878, reference 29496; FHL microfilm 1,845,218. “Canada Census, 1881,” database with images, FamilySearch (https://familysearch.org/ark:/61903/1:1:MVFC-RZP : 11 March 2018), Clarence M. Marpole in entry for Richard Marpole, ; from “1881 Canadian Census.” Database with images. Ancestry. (www.ancestry.com : 2008); citing Barrie, Simcoe North, Ontario, Canada; 1878; p. 78; Library and Archives Canada film number C-13251, Library and Archives Canada, Ottawa, Ontario. “Canada Census, 1891,” database, FamilySearch (https://familysearch.org/ark:/61903/1:1:MWKQ-PKG : 3 August 2016), Clarence M Morpole, Kamloops, Yale, British Columbia, Canada; Public Archives, Ottawa, Ontario; Library and Archives Canada film number 30953_148094. “Canada Census, 1901,” database with images, FamilySearch (https://familysearch.org/ark:/61903/1:1:KHVJ-MBD : 18 March 2018), Clarence Marpole in household of Emma Marpole, Burrard, British Columbia, Canada; citing p. 1, Library and Archives of Canada, Ottawa. “British Columbia Marriage Registrations, 1859-1932; 1937-1938,” database with images, FamilySearch (https://familysearch.org/ark:/61903/1:1:JDZX-7PH : 11 March 2018), Clarence Marveau Marpole and Mary Gifford Edmonds, 11 Dec 1901; citing , British Columbia, Canada, British Columbia Archives film number B11372, Vital Statistics Agency, Victoria; FHL microfilm 1,983,529. 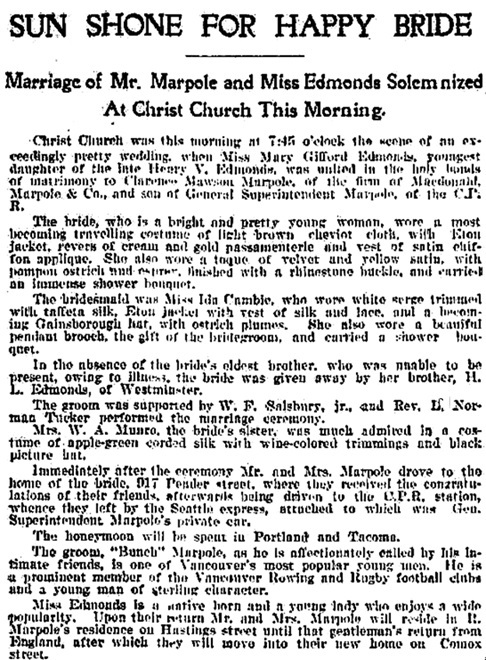 “Popular Young Couple Wedded: Mr. Clarence M. Marpole and Miss Mary Gifford Edmonds Married This Morning; Ceremony in Christ Church,” Vancouver Province, December 11, 1901, page 1. Capt. C. M. Marpole, Vancouver’s Pre WWI Rolls-Royce Cars and Their Owners, by John Peirson; http://antique.vccc.com/pioneers/VancouverRolls/rolls.htm. “Recensement du Canada de 1911,” database, FamilySearch (https://familysearch.org/ark:/61903/1:1:QV95-MPZV : 16 March 2018), Clarence Marpole, 1911; citing Census, Vancouver Sub-Districts 1-18, British Columbia, Canada, Library and Archives of Canada, Ottawa, Ontario; FHL microfilm 2,417,661. “California, San Francisco Passenger Lists, 1893-1953,” database with images, FamilySearch (https://familysearch.org/ark:/61903/1:1:QV1W-CB1Z : 12 March 2018), Clarence Marpole, 1914; citing San Francisco, San Francisco, California, United States, NARA microfilm publication M1410 (Washington, D.C.: National Archives and Records Administration, n.d.); FHL microfilm 1,465,649. Canadian Expeditionary Force; Name: Marpole, Clarence Mawson; Rank: CPT; Date of Birth: 04/03/1878; Reference: RG 150, Accession 1992-93/166, Box 5933 – 23; Item Number: 196285; Record Group: Canadian Expeditionary Force (CEF); http://www.bac-lac.gc.ca/eng/discover/military-heritage/first-world-war/personnel-records/Pages/item.aspx?IdNumber=196285; digitized service file: B5933-S023 http://central.bac-lac.gc.ca/.item/?op=pdf&app=CEF&id=B5933-S023. “Canadian Railway Man Dies,” Great Falls Tribune (Great Falls, Montana), July 17, 1918, page 10, column 3. [Clarence M. Marpole]..
“Capt. 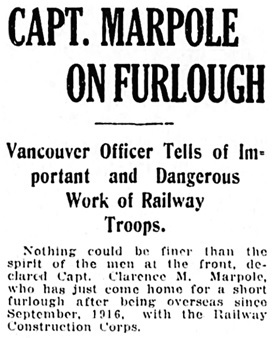 Marpole Buried,” Vancouver Daily World, July 19, 1918, page 2, column 1. “Military Men at Marpole Funeral,” Vancouver Province, July 19, 1918, page 11. Canadian Great War Project, Captain Clarence Mawson Marpole; Died: July 16, 1918; http://canadiangreatwarproject.com/searches/soldierDetail.asp?ID=21851. Vancouver Supreme Court Probate Files, File GR-1415.15918 – Marpole, Clarence M.; File location: Reel B0842 1.; Probate P – 05232; https://search-bcarchives.royalbcmuseum.bc.ca/marpole-clarence-m-3; first page of probate file, image 1379 of 3561: https://www.familysearch.org/ark:/61903/3:1:3QS7-997Z-N8FB?i=1378&wc=M69N-1Z9%3A332530701%2C332530502%2C333130201&cc=2014768; last page of probate file, image 1689 of 3561; https://www.familysearch.org/ark:/61903/3:1:3QSQ-G97Z-NZSS?i=1688&wc=M69N-1Z9%3A332530701%2C332530502%2C333130201&cc=2014768. “Auction, C.M. 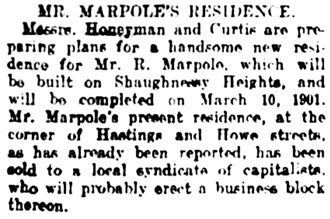 Marpole’s Estate,” Vancouver Sun, February 12, 1922, page 32; http://news.google.com/newspapers?id=millAAAAIBAJ&sjid=m4gNAAAAIBAJ&pg=1119%2C4450225. Robert A. J. McDonald, “Edmonds, Henry Valentine,” in Dictionary of Canadian Biography, vol. 12, University of Toronto/Université Laval, 2003–, accessed September 10, 2018, http://www.biographi.ca/en/bio/edmonds_henry_valentine_12E.html. “British Columbia Death Registrations, 1872-1986; 1992-1993”, database, FamilySearch (https://familysearch.org/ark:/61903/1:1:FLKC-3ZN : 8 November 2017), Jane Fortune Edmonds, 1906. British Columbia Baptisms; BC Archives Microfilm Number: B16234; Mary Gifford Edmonds; Baptism Date: January 22, 1878; place of baptism: New Westminster; father: Henry Valentine; mother: Jane Fortune; Denomination: Church of England; Church Name: Holy Trinity Cathedral; Other Location: New Westminster; Birth Date: November 20, 1878. “British Columbia Marriage Registrations, 1859-1932; 1937-1938,” database with images, FamilySearch (https://familysearch.org/ark:/61903/1:1:JDZX-7P7 : 11 March 2018), Clarence Marveau Marpole and Mary Gifford Edmonds, 11 Dec 1901; citing , British Columbia, Canada, British Columbia Archives film number B11372, Vital Statistics Agency, Victoria; FHL microfilm 1,983,529. “Recensement du Canada de 1911,” database, FamilySearch (https://familysearch.org/ark:/61903/1:1:QV95-MPZK : 16 March 2018), Dolly Marpole in entry for Clarence Marpole, 1911; citing Census, Vancouver Sub-Districts 1-18, British Columbia, Canada, Library and Archives of Canada, Ottawa, Ontario; FHL microfilm 2,417,661. “British Columbia Marriage Registrations, 1859-1932; 1937-1938,” database with images, FamilySearch (https://familysearch.org/ark:/61903/1:1:JDZT-FWQ : 11 March 2018), William Page Powell and Mary Gifford Marpole, 04 Sep 1918; citing Vancouver, British Columbia, Canada, British Columbia Archives film number B11389, Vital Statistics Agency, Victoria; FHL microfilm 1,984,110. “British Columbia Death Registrations, 1872-1986; 1992-1993”, database, FamilySearch (https://familysearch.org/ark:/61903/1:1:FLTN-N9N : 8 November 2017), Mary Gifford Powell, 1963; http://search-collections.royalbcmuseum.bc.ca/Image/Genealogy/d10900cb-df16-4ad1-8ff1-e64fef369a86. “Canada Passenger Lists, 1881-1922,” database with images, FamilySearch (https://familysearch.org/ark:/61903/1:1:2QS5-W6D : 11 March 2018), William Page Powell, Jun 1910; citing Immigration, Vancouver, British Columbia, Canada, T-4851, Library and Archives Canada, Ottawa, Ontario. “British Columbia Marriage Registrations, 1859-1932; 1937-1938,” database with images, FamilySearch (https://familysearch.org/ark:/61903/1:1:JDZT-FW4 : 11 March 2018), William Page Powell and Mary Gifford Marpole, 04 Sep 1918; citing Vancouver, British Columbia, Canada, British Columbia Archives film number B11389, Vital Statistics Agency, Victoria; FHL microfilm 1,984,110. “British Columbia Death Registrations, 1872-1986; 1992-1993”, database, FamilySearch (https://familysearch.org/ark:/61903/1:1:FLRB-2M4 : 8 November 2017), William Page Powell, 1935. “W. Page Powell Died in Sleep Wednesday,” Vancouver Province, August 22, 1935, page 1. “W.P. 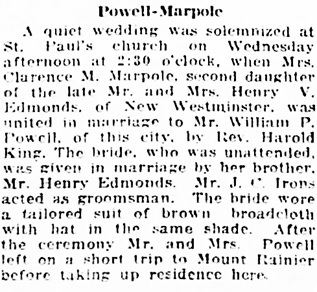 Powell Will be Buried on Saturday,” Vancouver Province, August 23, 1935, page 2. William Page Powell, death notice, Vancouver Province, August 23, 1935, page 17; Vancouver Sun, August 23, 1935, page 13. 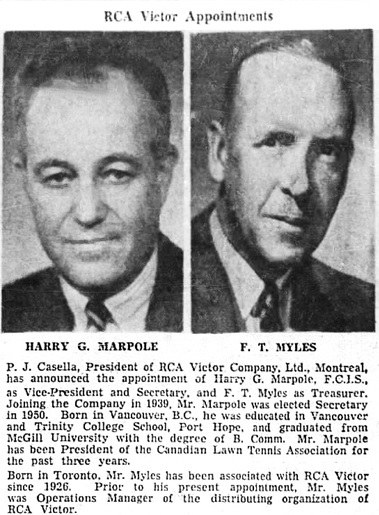 Harry Gifford Marpole, Canadian Who’s Who, 1964-1966, page 703. 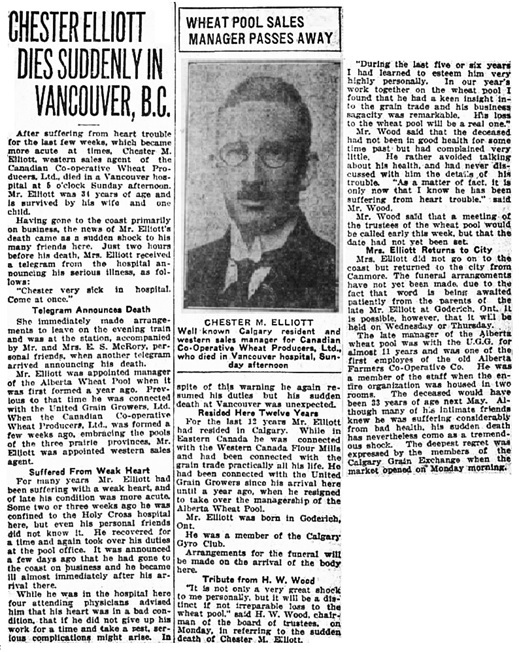 British Columbia Birth Registrations; Registration Number: 1903-09-123315; Harry Gifford Marpole; BC Archives Microfilm Number: B13819; GSU Microfilm Number: 2134889; date of birth: May 3, 1903; place of birth: Vancouver. “Recensement du Canada de 1911,” database, FamilySearch (https://familysearch.org/ark:/61903/1:1:QV95-MPZ2 : 16 March 2018), Harry Marpole in entry for Clarence Marpole, 1911; citing Census, Vancouver Sub-Districts 1-18, British Columbia, Canada, Library and Archives of Canada, Ottawa, Ontario; FHL microfilm 2,417,661. “California, San Francisco Passenger Lists, 1893-1953,” database with images, FamilySearch (https://familysearch.org/ark:/61903/1:1:QV1W-CB18 : 12 March 2018), Harry G Marpole, 1914; citing San Francisco, San Francisco, California, United States, NARA microfilm publication M1410 (Washington, D.C.: National Archives and Records Administration, n.d.); FHL microfilm 1,465,649. “Marpole, form III.b, Vancouver,” The Black and Red, volume 3, number 24, November 1915, page 2; https://www.smus.ca/sites/default/files/archive/blackrednovem1915univ.pdf. “New York Passenger Arrival Lists (Ellis Island), 1892-1924”, database with images, FamilySearch (https://familysearch.org/ark:/61903/1:1:JNW9-C3F : 30 January 2018), Harry Gifford Marpole, 1924. “New York, New York Passenger and Crew Lists, 1909, 1925-1957,” database with images, FamilySearch (https://familysearch.org/ark:/61903/1:1:24N7-BK9 : 12 March 2018), Harry Gifford Marpole, 1931; citing Immigration, New York, New York, United States, NARA microfilm publication T715 (Washington, D.C.: National Archives and Records Administration, n.d.). Ancestry.com. Quebec, Canada, Vital and Church Records (Drouin Collection), 1621-1968 [database on-line]. Provo, UT, USA: Ancestry.com Operations, Inc., 2008. Name: Harry Gifford Marpole; Religion: Anglican; Event Type: Mariage (Marriage); Marriage Date: 1935; Marriage Place: Montréal, Québec (Quebec); Place of Worship or Institution: Anglican Christ Church Cathedral,Actes; Spouse: Anna Monica Molesworth [Lyman]. British Columbia Death Registrations; Registration Number: 1997-09-017172; Harry Gifford Marpole; date of death: August 23, 1997; place of death: Victoria; age at death: 94; http://search-collections.royalbcmuseum.bc.ca/Image/Genealogy/8db3ebcb-e72c-45a4-8104-aadc3e171d45; http://search-collections.royalbcmuseum.bc.ca/Image/Genealogy/b9571629-f35a-4114-aed6-a6653781c7f6. 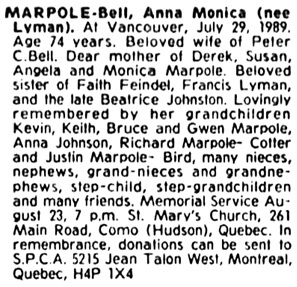 British Columbia Death Registrations; Registration Number: 1989-09-013009; Anna Monica Bell; BC Archives Microfilm Number: B17135; GSU Microfilm Number: 1709278; date of death: July 29, 1989; place of death: Vancouver; age at death: 74; http://search-collections.royalbcmuseum.bc.ca/Image/Genealogy/6c7cb5ad-fbb2-4450-86e7-8c003d6b531e; http://search-collections.royalbcmuseum.bc.ca/Image/Genealogy/86134b96-d358-4aa9-9d2c-9f4eb3683b08. Herbert Goulding Wilson (10 April 1872 – 5 January 1938). “England and Wales Birth Registration Index, 1837-2008,” database, FamilySearch (https://familysearch.org/ark:/61903/1:1:2XH7-2XY : 1 October 2014), Herbert Goulding Wilson, 1872; from “England & Wales Births, 1837-2006,” database, findmypast (http://www.findmypast.com : 2012); citing Birth Registration, Islington, London, England, citing General Register Office, Southport, England. “Canada Census, 1881,” database with images, FamilySearch (https://familysearch.org/ark:/61903/1:1:MV63-SSJ : 11 March 2018), Herbert Goulding Wilson in entry for William Wilson, ; from “1881 Canadian Census.” Database with images. Ancestry. (www.ancestry.com : 2008); citing James Bay Ward, Victoria (City), British Columbia, Canada; 1872; p. 79; Library and Archives Canada film number C-13285, Library and Archives Canada, Ottawa, Ontario. “British Columbia, Victoria Times Birth, Marriage and Death Notices, 1901-1939,” database with images, FamilySearch (https://familysearch.org/ark:/61903/1:1:QLBL-VWN4 : 15 March 2018), Herbert Goulding Wilson, Death 05 Jan 1937 [sic: 1938], British Columbia, Canada; from Victoria Daily Times news clippings, City of Victoria Archives, British Columbia, Canada; citing Victoria Daily Times, 06 Jan 1938; FHL microfilm 2,223,308. “British Columbia Death Registrations, 1872-1986; 1992-1993”, database, FamilySearch (https://familysearch.org/ark:/61903/1:1:FL2V-6JL : 8 November 2017), Herbert Goulding Wilson, 1938. “British Columbia Death Registrations, 1872-1986; 1992-1993”, database, FamilySearch (https://familysearch.org/ark:/61903/1:1:FLYF-S5H : 8 November 2017), Harriet Elizabeth Wilson, 1969. 1921 Canada Census, Kathleen Wilson in household of H. Goulding Wilson. Reference Number: RG 31; Folder Number: 20; Census Place: Ward 4, Victoria (City), British Columbia; Page Number: 1. Ancestry.com. 1921 Census of Canada [database on-line]. Provo, UT, USA: Ancestry.com Operations Inc, 2013. “New York, New York Passenger and Crew Lists, 1909, 1925-1957,” database with images, FamilySearch (https://familysearch.org/ark:/61903/1:1:24J8-4RL : 12 March 2018), Kathleen Goulding Wilson, 1935; citing Immigration, New York, New York, United States, NARA microfilm publication T715 (Washington, D.C.: National Archives and Records Administration, n.d.). “British Columbia Marriage Registrations, 1859-1932; 1937-1938,” database with images, FamilySearch (https://familysearch.org/ark:/61903/1:1:QKNL-2MHX : 17 March 2018), William Barber Lambert and Kathleen Goulding Wilson, 23 Oct 1937; citing Victoria, British Columbia, Canada, British Columbia Archives film number , Vital Statistics Agency, Victoria; FHL microfilm 100,548,085. “British Columbia Marriage Registrations, 1859-1932; 1937-1938,” database with images, FamilySearch (https://familysearch.org/ark:/61903/1:1:QKNL-2MH8 : 17 March 2018), William Barber Lambert and Kathleen Goulding Wilson, 23 Oct 1937; citing Victoria, British Columbia, Canada, British Columbia Archives film number , Vital Statistics Agency, Victoria; FHL microfilm 100,548,085. British Columbia Death Registrations; Registration Number: 1996-09-016327; Harry Page Powell; date of death: July 18, 1996; place of death: Vancouver; age at death: 76; http://search-collections.royalbcmuseum.bc.ca/Image/Genealogy/6bea65e4-3b2e-4ca8-bdf6-82ac8dc64303; medical certificate of death: http://search-collections.royalbcmuseum.bc.ca/Image/Genealogy/b29ae94c-70db-485e-88bf-235388032879. Dalton Penberthy Marpole: Birth: 05 Jan 1880 in Barrie, Simcoe, Ontario, Canada; Death: 29 Jan 1908 in Dot, Nicola Valley, British Columbia (ancestry.ca). “Ontario Births, 1869-1912,” database with images, FamilySearch (https://familysearch.org/ark:/61903/1:1:FM7M-F8Q : 16 July 2017), Dalton Penberthy Marpole, 05 Jan 1880; citing Birth, Barrie, Simcoe, Ontario, Canada, citing Archives of Ontario, Toronto; FHL microfilm 1,845,401. “Canada Census, 1881,” database with images, FamilySearch (https://familysearch.org/ark:/61903/1:1:MVFC-RZ5 : 11 March 2018), Dalton Marpole in entry for Richard Marpole, ; from “1881 Canadian Census.” Database with images. Ancestry. (www.ancestry.com : 2008); citing Barrie, Simcoe North, Ontario, Canada; 1880; p. 78; Library and Archives Canada film number C-13251, Library and Archives Canada, Ottawa, Ontario. “Canada Census, 1891,” database, FamilySearch (https://familysearch.org/ark:/61903/1:1:MWKQ-PKP : 3 August 2016), Dalton A Morpole, Kamloops, Yale, British Columbia, Canada; Public Archives, Ottawa, Ontario; Library and Archives Canada film number 30953_148094. “Canada Census, 1901,” database with images, FamilySearch (https://familysearch.org/ark:/61903/1:1:KHVJ-MB6 : 18 March 2018), Dalton P Marpole in household of Emma Marpole, Burrard, British Columbia, Canada; citing p. 1, Library and Archives of Canada, Ottawa. “British Columbia Marriage Registrations, 1859-1932; 1937-1938,” database with images, FamilySearch (https://familysearch.org/ark:/61903/1:1:JD8V-C35 : 11 March 2018), Walton Pemberthy Marpole and Catherine Annie Newland, 11 Jan 1904; citing Savona, British Columbia, Canada, British Columbia Archives film number B11383, Vital Statistics Agency, Victoria; FHL microfilm 1,983,976. “British Columbia Death Registrations, 1872-1986; 1992-1993”, database, FamilySearch (https://familysearch.org/ark:/61903/1:1:FLKS-R6Y : 8 November 2017), Dalton P Marpole, 1908. “D.P. Marpole is Burned to Death; Son of C.P.R. 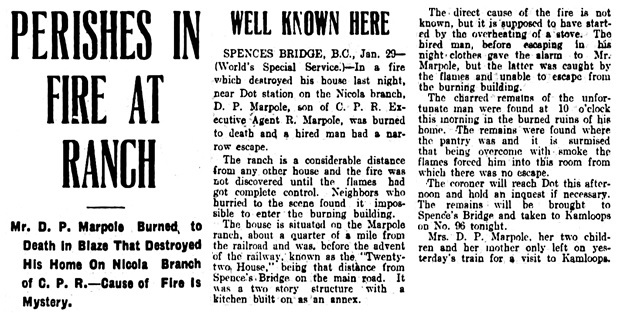 Official Met Untimely End Last Night in Fire Which Destroyed His Country House,” Vancouver Province, January 29, 1908, page 1. “United States Census, 1860”, database with images, FamilySearch (https://familysearch.org/ark:/61903/1:1:MC6W-8BS : 13 December 2017), James A Newland in entry for Silis Galliher, 1860. “British Columbia Marriage Registrations, 1859-1932; 1937-1938,” database with images, FamilySearch (https://familysearch.org/ark:/61903/1:1:JD8V-CX3 : 11 March 2018), James A Newland and Mary Pringle, 28 Oct 1875; citing Kamloops, British Columbia, Canada, British Columbia Archives film number B11383, Vital Statistics Agency, Victoria; FHL microfilm 1,983,976. “Canada Census, 1881,” database with images, FamilySearch (https://familysearch.org/ark:/61903/1:1:MV6S-V3X : 11 March 2018), James Armstrong Newland, ; from “1881 Canadian Census.” Database with images. Ancestry. (www.ancestry.com : 2008); citing Lytton & Cache Creek & Spence’s Bridge & Kamloops, Yale, British Columbia, Canada; 1833; p. 3; Library and Archives Canada film number C-13285, Library and Archives Canada, Ottawa, Ontario. “British Columbia Death Registrations, 1872-1986; 1992-1993”, database, FamilySearch (https://familysearch.org/ark:/61903/1:1:FL2X-V4Z : 8 November 2017), James Newland, 1898. “Canada Census, 1891,” database, FamilySearch (https://familysearch.org/ark:/61903/1:1:MWKQ-28H : 3 August 2016), James A Newland, Cache Creek, Yale, British Columbia, Canada; Public Archives, Ottawa, Ontario; Library and Archives Canada film number 30953_148094. “British Columbia Marriage Registrations, 1859-1932; 1937-1938,” database with images, FamilySearch (https://familysearch.org/ark:/61903/1:1:JD8V-CXM : 11 March 2018), James A Newland and Mary Pringle, 28 Oct 1875; citing Kamloops, British Columbia, Canada, British Columbia Archives film number B11383, Vital Statistics Agency, Victoria; FHL microfilm 1,983,976. “Canada Census, 1881,” database with images, FamilySearch (https://familysearch.org/ark:/61903/1:1:MV6S-V3F : 11 March 2018), Mary Newland in entry for James Armstrong Newland, ; from “1881 Canadian Census.” Database with images. Ancestry. (www.ancestry.com : 2008); citing Lytton & Cache Creek & Spence’s Bridge & Kamloops, Yale, British Columbia, Canada; 1842; p. 3; Library and Archives Canada film number C-13285, Library and Archives Canada, Ottawa, Ontario. “Canada Census, 1891,” database, FamilySearch (https://familysearch.org/ark:/61903/1:1:MWKQ-28C : 3 August 2016), Mary Newland, Cache Creek, Yale, British Columbia, Canada; Public Archives, Ottawa, Ontario; Library and Archives Canada film number 30953_148094. “Recensement du Canada de 1911,” database, FamilySearch (https://familysearch.org/ark:/61903/1:1:QV95-QGXJ : 16 March 2018), Mary Newland in entry for Kathrine Annie Marpole, 1911; citing Census, Yale and Cariboo Sub-Districts 1-54, British Columbia, Canada, Library and Archives of Canada, Ottawa, Ontario; FHL microfilm 2,417,664. “British Columbia Death Registrations, 1872-1986; 1992-1993”, database, FamilySearch (https://familysearch.org/ark:/61903/1:1:FLKV-RXV : 8 November 2017), Mary Newland, 1924. Mary Newland, obituary, Kamloops Sentinel, November 7, 1924, cited in “More information on an early pioneer,” Ashcroft Journal, September 27, 1983, page 5, column 1. “James Newland ran the Bonaparte House,” Ashcroft Journal, August 16, 1983, page2. Katherine Anne Newland: Birth: 8 December 1879 in New Westminster, Greater Vancouver Regional District, British Columbia, Canada; Death: 03 Mar 1960 in Vancouver, British Columbia (ancestry.ca). “Canada Census, 1881,” database with images, FamilySearch (https://familysearch.org/ark:/61903/1:1:MV6S-V3N : 11 March 2018), Catherine Annie Newland in entry for James Armstrong Newland, ; from “1881 Canadian Census.” Database with images. Ancestry. (www.ancestry.com : 2008); citing Lytton & Cache Creek & Spence’s Bridge & Kamloops, Yale, British Columbia, Canada; 1880; p. 3; Library and Archives Canada film number C-13285, Library and Archives Canada, Ottawa, Ontario. “Canada Census, 1891,” database, FamilySearch (https://familysearch.org/ark:/61903/1:1:MWKQ-28Z : 3 August 2016), Catharine A Newland, Cache Creek, Yale, British Columbia, Canada; Public Archives, Ottawa, Ontario; Library and Archives Canada film number 30953_148094. “Canada Census, 1901,” database with images, FamilySearch (https://familysearch.org/ark:/61903/1:1:KHVG-KQ2 : 18 March 2018), Annie K Newland, Yale & Cariboo, British Columbia, Canada; citing p. 8, Library and Archives of Canada, Ottawa. “British Columbia Marriage Registrations, 1859-1932; 1937-1938,” database with images, FamilySearch (https://familysearch.org/ark:/61903/1:1:JD8V-C3L : 11 March 2018), Walton Pemberthy Marpole and Catherine Annie Newland, 11 Jan 1904; citing Savona, British Columbia, Canada, British Columbia Archives film number B11383, Vital Statistics Agency, Victoria; FHL microfilm 1,983,976. “Recensement du Canada de 1911,” database, FamilySearch (https://familysearch.org/ark:/61903/1:1:QV95-QGX6 : 16 March 2018), Kathrine Annie Marpole, 1911; citing Census, Yale and Cariboo Sub-Districts 1-54, British Columbia, Canada, Library and Archives of Canada, Ottawa, Ontario; FHL microfilm 2,417,664. “British Columbia Death Registrations, 1872-1986; 1992-1993”, database, FamilySearch (https://familysearch.org/ark:/61903/1:1:FLR3-4BR : 8 November 2017), Katherine Anne Marpole, 1960; http://search-collections.royalbcmuseum.bc.ca/Image/Genealogy/11e4c35b-e54e-43b2-aba7-423e690a0295. Monica Primrose Marpole: Birth: 19 Apr 1905 in Vancouver, Greater Vancouver Regional District, British Columbia, Canada; Death: 4 Sep 1956 in Vancouver, British Columbia (ancestry.ca). 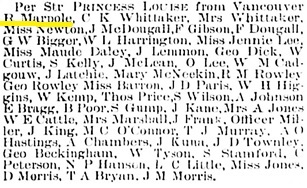 “Recensement du Canada de 1911,” database, FamilySearch (https://familysearch.org/ark:/61903/1:1:QV95-QGXX : 16 March 2018), Monica Primrose Marpole in entry for Kathrine Annie Marpole, 1911; citing Census, Yale and Cariboo Sub-Districts 1-54, British Columbia, Canada, Library and Archives of Canada, Ottawa, Ontario; FHL microfilm 2,417,664. “British Columbia Marriage Registrations, 1859-1932; 1937-1938,” database with images, FamilySearch (https://familysearch.org/ark:/61903/1:1:JD8X-98F : 11 March 2018), Aeneas Mcbean Bell-Irvine and Monica Primrose Marpole, 20 Jul 1929; citing Vancouver, British Columbia, Canada, British Columbia Archives film number B13757, Vital Statistics Agency, Victoria; FHL microfilm 2,074,553. “British Columbia Death Registrations, 1872-1986; 1992-1993”, database, FamilySearch (https://familysearch.org/ark:/61903/1:1:FL5B-5P2 : 8 November 2017), Monica Primrose Bell-Irving, 1956. Aeneas McBean Bell-Irving: Birth: 3 May 1898 in Vancouver, British Columbia, Canada; Death: 20 November 1966 in Vancouver, British Columbia, Canada (ancestry.ca). Aeneas McBean Bell-Irving in entry for Henry Ogle Bell-Irving, Vancouver Voters, 1886, page 97. Canadian Great War Project; Second Lieutenant Aeneas McBean Bell-Irving; http://canadiangreatwarproject.com/searches/soldierDetail.asp?ID=170845. “British Columbia Marriage Registrations, 1859-1932; 1937-1938,” database with images, FamilySearch (https://familysearch.org/ark:/61903/1:1:JD8X-98V : 11 March 2018), Aeneas Mcbean Bell-Irvine and Monica Primrose Marpole, 20 Jul 1929; citing Vancouver, British Columbia, Canada, British Columbia Archives film number B13757, Vital Statistics Agency, Victoria; FHL microfilm 2,074,553. “British Columbia Death Registrations, 1872-1986; 1992-1993”, database, FamilySearch (https://familysearch.org/ark:/61903/1:1:FLT1-FYY : 8 November 2017), Aeneas Mcbean Bell-Irving, 1966. 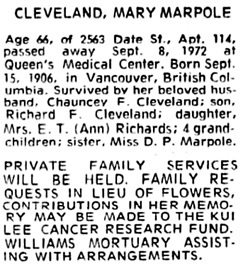 Mary Muriel Marpole: Birth: 15 Sep 1906 in British Columbia, Canada; Death: Sep 1972 in Honolulu, Hawaii (ancestry.ca). “Recensement du Canada de 1911,” database, FamilySearch (https://familysearch.org/ark:/61903/1:1:QV95-QGXF : 16 March 2018), Mary Muriel Marpole in entry for Kathrine Annie Marpole, 1911; citing Census, Yale and Cariboo Sub-Districts 1-54, British Columbia, Canada, Library and Archives of Canada, Ottawa, Ontario; FHL microfilm 2,417,664. “British Columbia Marriage Registrations, 1859-1932; 1937-1938,” database with images, FamilySearch (https://familysearch.org/ark:/61903/1:1:JD8N-DR1 : 11 March 2018), Chauncey Fitch Cleveland and Mary Muriel Marpole, 08 Nov 1928; citing Vancouver, British Columbia, Canada, British Columbia Archives film number B13755, Vital Statistics Agency, Victoria; FHL microfilm 2,074,508. “United States Census, 1930,” database with images, FamilySearch (https://familysearch.org/ark:/61903/1:1:XH1N-KH4 : accessed 8 September 2018), Mary M Cleveland in household of Chauncy F Cleveland, Honolulu, Honolulu, Hawaii, United States; citing enumeration district (ED) ED 47, sheet 1A, line 44, family 13, NARA microfilm publication T626 (Washington D.C.: National Archives and Records Administration, 2002), roll 2634; FHL microfilm 2,342,368. “United States Census, 1940,” database with images, FamilySearch (https://familysearch.org/ark:/61903/1:1:VB96-ZD7 : 14 March 2018), Mary Cleveland in household of Chauncey F Cleveland, Tract 17, Honolulu Judicial District, Representative District 4, Honolulu, Hawaii Territory, United States; citing enumeration district (ED) 2-31, sheet 12A, line 30, family 292, Sixteenth Census of the United States, 1940, NARA digital publication T627. Records of the Bureau of the Census, 1790 – 2007, RG 29. Washington, D.C.: National Archives and Records Administration, 2012, roll 4584. “United States Social Security Death Index,” database, FamilySearch (https://familysearch.org/ark:/61903/1:1:V3P4-KPV : 20 May 2014), Mary Cleveland, Sep 1972; citing U.S. Social Security Administration, Death Master File, database (Alexandria, Virginia: National Technical Information Service, ongoing). Chauncey Fitch Cleveland: Birth: 6 Dec 1886 in Hartford, Connecticut, United States; Death: Dec 1981 in Kihei, Maui, Hawaii, United States (ancestry.ca). “United States Census, 1900,” database with images, FamilySearch (https://familysearch.org/ark:/61903/1:1:M9QP-W2Q : accessed 8 September 2018), Chauncey F Cleveland in household of Edward S Cleveland, Hartford city Ward 9, Hartford, Connecticut, United States; citing enumeration district (ED) 184, sheet 3A, family 24, NARA microfilm publication T623 (Washington, D.C.: National Archives and Records Administration, 1972. ); FHL microfilm 1,240,138. “United States World War I Draft Registration Cards, 1917-1918,” database with images, FamilySearch (https://familysearch.org/ark:/61903/1:1:K6ZX-LKC : 13 March 2018), Chauncey Fitch Cleveland, 1917-1918; citing Honolulu City no 1, Hawaii, United States, NARA microfilm publication M1509 (Washington D.C.: National Archives and Records Administration, n.d.); FHL microfilm 1,452,095. “British Columbia Marriage Registrations, 1859-1932; 1937-1938,” database with images, FamilySearch (https://familysearch.org/ark:/61903/1:1:JD8N-DTS : 11 March 2018), Chauncey Fitch Cleveland and Mary Muriel Marpole, 08 Nov 1928; citing Vancouver, British Columbia, Canada, British Columbia Archives film number B13755, Vital Statistics Agency, Victoria; FHL microfilm 2,074,508. “United States Census, 1930,” database with images, FamilySearch (https://familysearch.org/ark:/61903/1:1:XH1N-KHW : accessed 8 September 2018), Chauncy F Cleveland, Honolulu, Honolulu, Hawaii, United States; citing enumeration district (ED) ED 47, sheet 1A, line 43, family 13, NARA microfilm publication T626 (Washington D.C.: National Archives and Records Administration, 2002), roll 2634; FHL microfilm 2,342,368. “United States Census, 1940,” database with images, FamilySearch (https://familysearch.org/ark:/61903/1:1:VB96-ZDQ : 14 March 2018), Chauncey F Cleveland, Tract 17, Honolulu Judicial District, Representative District 4, Honolulu, Hawaii Territory, United States; citing enumeration district (ED) 2-31, sheet 12A, line 29, family 292, Sixteenth Census of the United States, 1940, NARA digital publication T627. Records of the Bureau of the Census, 1790 – 2007, RG 29. Washington, D.C.: National Archives and Records Administration, 2012, roll 4584. “United States World War II Draft Registration Cards, 1942,” database with images, FamilySearch (https://familysearch.org/ark:/61903/1:1:VKMC-Q5K : 11 March 2018), Chauncey Fitch Cleveland, 1942; citing NARA microfilm publication M1936, M1937, M1939, M1951, M1962, M1964, M1986, M2090, and M2097 (Washington D.C.: National Archives and Records Administration, n.d.). “United States Social Security Death Index,” database, FamilySearch (https://familysearch.org/ark:/61903/1:1:VM91-NZQ : 20 May 2014), Chauncey Cleveland, Dec 1981; citing U.S. Social Security Administration, Death Master File, database (Alexandria, Virginia: National Technical Information Service, ongoing). Dalton Penberthy Marpole: Birth: 2 Jun 1908 in British Columbia, Canada; Death: 11 Apr 1994 in Vancouver, British Columbia, Canada (ancestry.ca). “Recensement du Canada de 1911,” database, FamilySearch (https://familysearch.org/ark:/61903/1:1:QV95-QGXN : 16 March 2018), Dalton Penberthy Marpole in entry for Kathrine Annie Marpole, 1911; citing Census, Yale and Cariboo Sub-Districts 1-54, British Columbia, Canada, Library and Archives of Canada, Ottawa, Ontario; FHL microfilm 2,417,664. “Hawaii, Honolulu Passenger Lists, 1900-1953,” database with images, FamilySearch (https://familysearch.org/ark:/61903/1:1:QV9Z-FZ2P : 16 March 2018), Dalton P Marpole, 1930; citing Ship , NARA microfilm publication A3422 (Washington D.C.: National Archives and Records Administration, n.d.). First Aid Nursing Yeomanry, Wikipedia article, https://en.wikipedia.org/wiki/First_Aid_Nursing_Yeomanry. First Aid Nursing Yeomanry, https://www.fany.org.uk/history. “California, San Francisco Passenger and Crew Lists of Vessels Arriving, 1954-1957”, database with images, FamilySearch (https://familysearch.org/ark:/61903/1:1:Q29D-XVW1 : 17 March 2018), Dalton Marpole, 1955. British Columbia Death Registrations; Registration Number: 1994-09-007764; D’alton Marpole; date of death: April 11, 1994; place of death: Vancouver; age at death: 85; http://search-collections.royalbcmuseum.bc.ca/Image/Genealogy/fb152d71-4a9e-44e9-ac21-798ee558988b; medical certificate of death: http://search-collections.royalbcmuseum.bc.ca/Image/Genealogy/0b8fd0be-e677-43cd-84c7-40ce7e7a3711. British Columbia Birth Registrations; Registration Number: 1887-09-181263; Richard F Marpole; BC Archives Microfilm Number: B13808; GSU Microfilm Number: 2114957; date of birth: September 27, 1887; place of birth: Kamloops. “Canada Census, 1891,” database, FamilySearch (https://familysearch.org/ark:/61903/1:1:MWKQ-PK5 : 3 August 2016), Richard F Morpole, Kamloops, Yale, British Columbia, Canada; Public Archives, Ottawa, Ontario; Library and Archives Canada film number 30953_148094. “Canada Census, 1901,” database with images, FamilySearch (https://familysearch.org/ark:/61903/1:1:KHVJ-MBX : 18 March 2018), Richard F Marpole in household of Emma Marpole, Burrard, British Columbia, Canada; citing p. 1, Library and Archives of Canada, Ottawa. 1921 Canada Census, Richard Marpole, Reference Number: RG 31; Folder Number: 18; Census Place: Ward 1, Vancouver Centre, British Columbia; Page Number: 9. Ancestry.com. 1921 Census of Canada [database on-line]. Provo, UT, USA: Ancestry.com Operations Inc, 2013. Library and Archives Canada; Form 30A Ocean Arrivals (Individual Manifests), 1919-1924; Rolls: T-14939 – T-15248. Ancestry.com. Canada, Ocean Arrivals (Form 30A), 1919-1924 [database on-line]. Provo, UT, USA: Ancestry.com Operations, Inc., 2009. Name: Richard Frederick Marpole; Gender: Male; Estimated Birth Year: abt 1888; Birth Place: Kamloops, British Columbia; Age: 36; Date of Arrival: 22 May 1924; Port of Arrival: Vancouver, British Columbia; Port of Departure: Ship name; Ship Name: Empress of Canada. “New York, New York Passenger and Crew Lists, 1909, 1925-1957,” database with images, FamilySearch (https://familysearch.org/ark:/61903/1:1:246K-ZZC : 12 March 2018), Richard F Marpole, 1927; citing Immigration, New York, New York, United States, NARA microfilm publication T715 (Washington, D.C.: National Archives and Records Administration, n.d.). “British Columbia Death Registrations, 1872-1986; 1992-1993”, database, FamilySearch (https://familysearch.org/ark:/61903/1:1:FL2K-S88 : 8 November 2017), Richard Frederick Marpole, 1937. 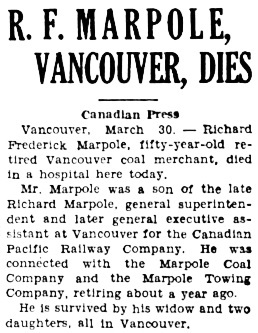 “Richard Frederick Marpole, second son of the late Richard Marpole, who was general superintendent and later western executive for the Canadian Pacific Railway, died in St. Paul’s Hospital early this morning. He was admitted to the hospital four days ago. Funeral services will be held in the chapel of Nunn & Thomson Undertaking Co. at 2 p.m. Thursday. “The ranks of Vancouver business men were thinned with the sudden death early this morning of Richard Frederick Marpole, 52, in St. Paul’s Hospital. Mr. Marpole was born in Kamloops and was prominent in the business world of Vancouver, being connected with the Marpole Coal Company and other varied business interest in the city. Besides his wife he is survived by two daughters, Garda Ann and Shirley Joy. 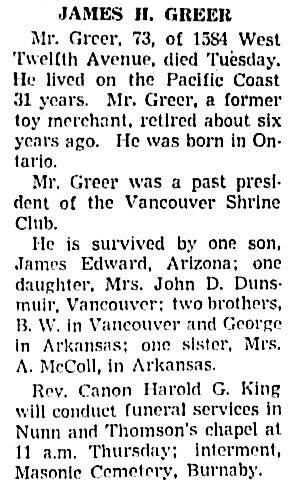 “British Columbia Death Registrations, 1872-1986; 1992-1993”, database, FamilySearch (https://familysearch.org/ark:/61903/1:1:FLLM-XXC : 8 November 2017), James Henry Greer, 1939. “British Columbia Death Registrations, 1872-1986; 1992-1993”, database, FamilySearch (https://familysearch.org/ark:/61903/1:1:FL28-LLM : 8 November 2017), Emily Pender Greer, 1930. “Washington, County Marriages, 1855-2008,” database with images, FamilySearch (https://familysearch.org/ark:/61903/1:1:QKNB-QBW5 : 28 September 2017), Richard Frederick Marpole and Zelma Ellen Greer, 03 May 1912, Pierce, Washington, United States, State Archives, Olympia; FamilySearch digital folder 004223823. 1921 Canada Census, Zelma Marpole in household of Richard Marpole, Reference Number: RG 31; Folder Number: 18; Census Place: Ward 1, Vancouver Centre, British Columbia; Page Number: 9. Ancestry.com. 1921 Census of Canada [database on-line]. Provo, UT, USA: Ancestry.com Operations Inc, 2013. “British Columbia Marriage Registrations, 1859-1932; 1937-1938,” database with images, FamilySearch (https://familysearch.org/ark:/61903/1:1:JD8N-6KL : 11 March 2018), John Duncan Dunsmuir and Zelma Ellen Marpole, 08 Sep 1928; citing Vancouver, British Columbia, Canada, British Columbia Archives film number B13755, Vital Statistics Agency, Victoria; FHL microfilm 2,074,508; http://search-collections.royalbcmuseum.bc.ca/Image/Genealogy/dfbd4786-ffbb-45a5-b51b-765ad47ec9b8. “British Columbia Death Registrations, 1872-1986; 1992-1993”, database, FamilySearch (https://familysearch.org/ark:/61903/1:1:FLTK-YSJ : 8 November 2017), Zelma Ellen Dunsmuir, 1964; http://search-collections.royalbcmuseum.bc.ca/Image/Genealogy/e3686388-9110-4463-b239-7dd2d4cbfa01. “British Columbia Marriage Registrations, 1859-1932; 1937-1938,” database with images, FamilySearch (https://familysearch.org/ark:/61903/1:1:JD8N-6K5 : 11 March 2018), John Duncan Dunsmuir and Zelma Ellen Marpole, 08 Sep 1928; citing Vancouver, British Columbia, Canada, British Columbia Archives film number B13755, Vital Statistics Agency, Victoria; FHL microfilm 2,074,508. 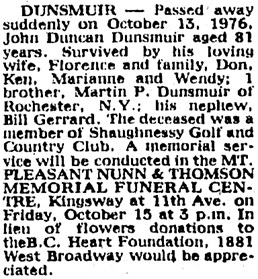 “British Columbia Death Registrations, 1872-1986; 1992-1993”, database, FamilySearch (https://familysearch.org/ark:/61903/1:1:FL13-B9N : 8 November 2017), John Duncan Dunsmuir, 1976; http://search-collections.royalbcmuseum.bc.ca/Image/Genealogy/ef5dfb87-5829-44e3-adef-ca44a446935c. “British Columbia Death Registrations, 1872-1986; 1992-1993”, database, FamilySearch (https://familysearch.org/ark:/61903/1:1:FLKT-RPF : 8 November 2017), Florence Bessie Dunsmuir, 1985; http://search-collections.royalbcmuseum.bc.ca/Image/Genealogy/b4ff63ef-5977-4b4c-b44c-33361f0e3ecb. Ancestry.com. Web: Manitoba, Canada, Birth Index, 1870-1917 [database on-line]. Provo, UT, USA: Ancestry.com Operations, Inc., 2013. Name: Olive Joy Todd; Gender: Female; Birth Date: 22 Oct 1896; Birth Place: R.M. of Blanshard, Manitoba, Canada; Mother: Annie Jane Borland. “Canada Census, 1901,” database with images, FamilySearch (https://familysearch.org/ark:/61903/1:1:KHVY-2L6 : 18 March 2018), Olive J Todd in household of Annie J Todd, Marquette, Manitoba, Canada; citing p. 4, Library and Archives of Canada, Ottawa. “Canada Census, 1906,” database, FamilySearch (https://familysearch.org/ark:/61903/1:1:KHJV-QPK : 1 April 2016), Olive Todd in household of James Todd, 5, Marquette, Manitoba, Canada; Public Archives, Ottawa, Ontario. “Recensement du Canada de 1911,” database, FamilySearch (https://familysearch.org/ark:/61903/1:1:QV95-CJQ3 : 16 March 2018), Olive Todd in entry for James Todd, 1911; citing Census, Marquette Sub-Districts 1-30, Manitoba, Canada, Library and Archives of Canada, Ottawa, Ontario; FHL microfilm 2,417,667. “Canada Census, 1916,” database with images, FamilySearch (https://familysearch.org/ark:/61903/1:1:KM5D-M9M : 11 March 2018), Olive J Todd in household of Victor P Bond, Alberta, Canada; citing p. 29, line 26; Library and Archives Canada, Ottawa, Ontario; FHL microfilm 2,434,964. Ancestry.com. Alberta, Canada, Marriages Index,1898-1942 [database on-line]. Lehi, UT, USA: Ancestry.com Operations, Inc., 2017. Name: Olive J. Todd; Gender: Female; Marriage Date: 1918; Marriage Place: Edmonton, Alberta, Canada; Spouse: Chester M. Elliot. 1921 Canada Census; Olive Elliott in household of Chester M Elliott; Reference Number: RG 31; Folder Number: 4; Census Place: City of Calgary (Part), Calgary West, Alberta; Page Number: 13. Ancestry.com. 1921 Census of Canada [database on-line]. Provo, UT, USA: Ancestry.com Operations Inc, 2013. Ancestry.com. Alberta, Canada, Marriages Index,1898-1942 [database on-line]. Lehi, UT, USA: Ancestry.com Operations, Inc., 2017. 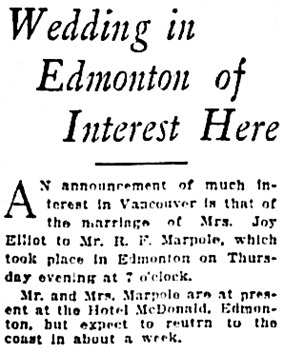 Name: Olive Joy Elliott; Gender: Female; Marriage Date: 1927; Marriage Place: Edmonton, Alberta, Canada; Spouse: Richard F. Marpole. “New York, New York Passenger and Crew Lists, 1909, 1925-1957,” database with images, FamilySearch (https://familysearch.org/ark:/61903/1:1:246K-ZZZ : 12 March 2018), Olive J Marpole, 1927; citing Immigration, New York, New York, United States, NARA microfilm publication T715 (Washington, D.C.: National Archives and Records Administration, n.d.). “British Columbia Death Registrations, 1872-1986; 1992-1993”, database, FamilySearch (https://familysearch.org/ark:/61903/1:1:FLBZ-3JC : 8 November 2017), Olive Joy Marpole, 1967; http://search-collections.royalbcmuseum.bc.ca/Image/Genealogy/933d9c9d-4ca2-4e10-a316-99e950dd21d7. “Find A Grave Index,” database, FamilySearch (https://familysearch.org/ark:/61903/1:1:QVV5-QYRZ : 13 December 2015), Olive Joy Marpole, ; Burial, Vancouver, Greater Vancouver Regional District, British Columbia, Canada, Mountain View Cemetery; citing record ID 26420261, Find a Grave, https://www.findagrave.com/memorial/26420261; “Olive Joy Todd Marpole; Birth: 22 Oct 1896, Manitoba, Canada; Death: 5 Jun 1967 (aged 70), Vancouver, Greater Vancouver Regional District, British Columbia, Canada; Burial: Mountain View Cemetery, Vancouver, Greater Vancouver Regional District, British Columbia, Canada; Plot: HORNE1/4/01/025/0009; Memorial ID: 26420261. “Ontario Births, 1869-1912,” database with images, FamilySearch (https://familysearch.org/ark:/61903/1:1:FM72-462 : 10 August 2017), Chester Melton Elliott, 25 May 1891; citing Birth, Goderich, Huron, Ontario, Canada, citing Archives of Ontario, Toronto; FHL microfilm 1,846,443. Ancestry.com. Alberta, Canada, Marriages Index,1898-1942 [database on-line]. Lehi, UT, USA: Ancestry.com Operations, Inc., 2017. Name: Chester M. Elliot; Gender: Male; Marriage Date: 1918; Marriage Place: Edmonton, Alberta, Canada; Spouse: Olive J. Todd. 1921 Canada Census; Chester M Elliott; Reference Number: RG 31; Folder Number: 4; Census Place: City of Calgary (Part), Calgary West, Alberta; Page Number: 13. Ancestry.com. 1921 Census of Canada [database on-line]. Provo, UT, USA: Ancestry.com Operations Inc, 2013. “British Columbia Death Registrations, 1872-1986; 1992-1993”, database, FamilySearch (https://familysearch.org/ark:/61903/1:1:FLG3-QM6 : 8 November 2017), Chester Milton Elliott, 1924. Shirley Joy Marpole (1923–2015); Birth: 26 OCT 1923; Death: 10 NOV 2015, Quesnel, British Columbia, Canada (ancestry.ca). “Life was way too short for Mom! Shirley passed away peacefully in Quesnel at age 92, leaving behind family and friends who will be eternally grateful for the mark she made. Predeceased by her husband, Chester Cotter, 1996, and sister Garda Johnstone, 2014, she will be missed by her children Rick Cotter, Joel (Kate), Jan (Michael) Kidston, Doug (Ashley), 11 grandchildren and 6 great grandchildren. We’ll see you later Gramma! Shirley moved from Calgary to Vancouver after her father Chester Elliott passed away at a young age. Vancouver was the place of long lasting friendships, interests in vintage cars, music and animals. As part of the War effort she packed parachutes, and riveted Warbirds at YVR. Chester and Shirley were married in 1951, and moved to paradise in Bachelor Bay near Whytecliff Park. She loved the romance of the Cariboo, so moving to Quesnel in 1966 with Chester’s work suited her perfectly. Shirley was involved in and believed in the Quesnel Community. She loved the people, the four seasoned country, travel, pottery and painting, singing with Sweet Adelines, and shopping for Seniors, and of course this great place for kids to grow up. Frequent visits to the Green Lake cabin were a necessity of life. Home was for family, entertaining and culinary delights, but home was for Shirley’s animal friends as well. She truly loved animals and this was passed on. Thanks Mom! Donkeys, dogs, mules and horses, peacocks, bees, cats and more; you name it, they were all welcome. Shirley loved adventure, going down the unknown road. She could have been anything, but she was something else! A memorial service for Shirley will take place on Tuesday, December 8th at 1 pm. At Clayton’s Funeral Chapel in Quesnel. A reception tea will follow at the Anglican Church Hall. Gallery of Honour, by Annie Gallant, Quesnel Cariboo Observer, February 3, 2016, page A9 (includes biographies of honorees Betsy Van Halderen, Shirley Cotter and Murray Boal); https://issuu.com/blackpress/docs/i20160203044840371. Chester HB Cotter (–1996); Birth: Unknown; Death: 1996 (ancestry.ca). Britsih Columbia Death Registrations; Registration Number: 1996-09-025517; Harry Barfield Chester Cotter; date of death: December 15, 1996; place of death: Quesnel; age at death: 75; http://search-collections.royalbcmuseum.bc.ca/Image/Genealogy/d6594d33-5c00-4faf-83f5-0e92887cf63d; medical certificate of death: http://search-collections.royalbcmuseum.bc.ca/Image/Genealogy/0d6722ff-fecb-4423-bdfd-01be8a336b1b. Quesnel & District Cemetery, Cariboo Regional District, BC; Harry Barfield Chester Cotter (1921-1996); http://geneofun.on.ca/names/photo/2513094 [includes photograph]. “The Death of Far More Than a Salesman: A Tribute to Chester Cotter, June 28 1921-December 15, 1996, by Jerry MacDonald, Quesnel Cariboo Observer, page A21. “Florida Marriage Index, 1822-1875 and 1927-2001,” database, FamilySearch (https://familysearch.org/ark:/61903/1:1:VJVG-8VN : 28 November 2014), Garda Ann Marpole, 1954; from “Florida, Marriage Collection, 1822-1875 and 1927-2001,” database and images, Ancestry (http://www.ancestry.com : 2006); citing Florida Department of Health, Jacksonville, Florida; and Jordan Dodd, Liahona Research. “Florida Marriage Index, 1822-1875 and 1927-2001,” database, FamilySearch (https://familysearch.org/ark:/61903/1:1:VJVP-S65 : 28 November 2014), Peter Randolph Johnstone, 1954; from “Florida, Marriage Collection, 1822-1875 and 1927-2001,” database and images, Ancestry (http://www.ancestry.com : 2006); citing Florida Department of Health, Jacksonville, Florida; and Jordan Dodd, Liahona Research.